The word Drone has become a popular one worldwide. For the past three years consumers have helped increased drone sales year after year, with no signs of slowing down anytime soon. This is still an untapped market where possibilities have been endless for drone use applications and it’s extremely exciting to watch it all unfold. Governments worldwide have taken notice and have had to step in and create regulations when not too long ago there were none. People who started early with drones have been lucky to fly freely, but that has essentially changed for many parts of the world. A recent 2017 report from ‘The NPD Group’ has found that done sales in the USA have grown 117% year-over-year and that while premium priced drone sales have been steady, there’s a large demand for lower cost drones, especially by the holiday season. They have also noted that drone buyers opted for ones that were packed with more technology, which isn’t surprising. Within the drone market there has been a huge rise of interest for Racing Drones. On March 11, 2016, Dubai hosted the inaugural World Drone Prix competition, making it the biggest drone racing event in history thus far with a multi-million dollar prize pool, which essentially legitimized drone racing as a sport. Even ESPN broadcasted the event on their network which says a lot. A 15-year old British teenager won $250,000 in the event he was competing in. It should be noted that the word drone is quite a general term that has been misused. Drones down to their basic form are multi-rotor aircraft. Just as helicopters utilize a single motor, drones in the same way can use multiple motors, and thereby making drones more flexible and complex. I consider drones a hybrid combination of airplane and helicopter, providing a little bit of both worlds. The most popular form of drone today is called the quadcopter...where quad meaning four, and copter means a type of aircraft. In the past I’ve made it a point to use the correct term of quadcopter; however, I'll have to succumb to what the majority of people have been using to describe these awesome inventions in the general and misused form of drones. From now on I will refer to quadcopters as drones in my review, even though they are also technically quadcopters. In late 2016, I had my first introduction to a Chinese company named MEIJIAXIN TOYS CO., LIMITED (or simply referred to as MJX), who have been at the forefront of putting affordable toy grade drones into consumer hands since the market started. I reviewed MJX's unique Bugs 3 which was their first attempt into the premium brushless drone market and once I had it in hand and flown it, it was for me the best drone I’d flown that whole year. I knew it would be a hit heading into 2017. The MJX Bugs 3 has been selling like hotcakes worldwide and for good reason. 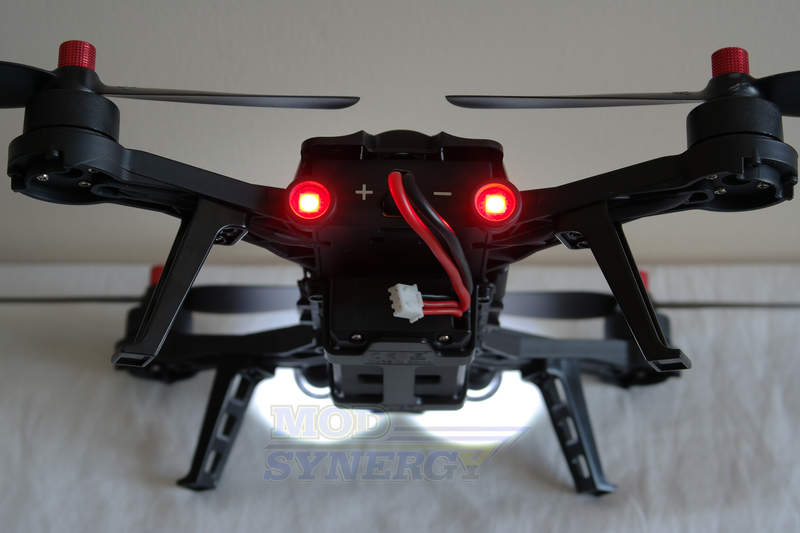 Please read my MJX Bugs 3 Brushless Drone Review if you haven’t already. Today I’m excited to share with you, in a world exclusive first review, MJX’s first attempt into the FPV racing drone segment. MJX wants a chunk of that growing and lucrative piece of the drone market and have produced their Bugs 8 250mm FPV Brushless Racing Drone, which they are marketing as an entry-level FPV racing drone for beginners getting into the sport of drone racing. I haven’t flown a racing drone before, therefore who better to test the MJX Bugs 8 than I? Without further ado, let’s get started in this in-depth review! Editor's Note: In other regions of the world, the MJX Bugs 8 is named MJX Bugs 6; both are exactly the same. "MJX" MEIJIAXIN TOYS CO., LIMITED is one of the main professional manufacturers in the R/C radio control model industry. The faith of “dream” is the motive power behind company’s growth, MJX is always committed itself to development of “Toys and hobby”, which target is to bring incredible, new entertainment experience to the consumers all over the world. With the spirit of “Innovation & Quality” and the mission to create “Passion and Happiness” for the blue planet, MJX is always devoting itself to develop, produce and sell the most reliable and safest toys & models. From radio control cars to radio control helicopters & multicopters, every product is well-designed and with innovative technology applied. 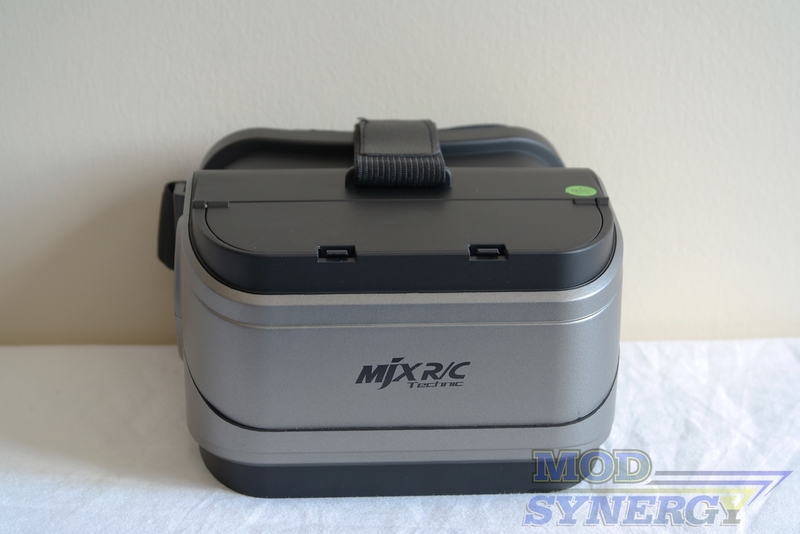 Consumers could enjoy the feeling of passion, happy and safe that MJX R/C technology brings." 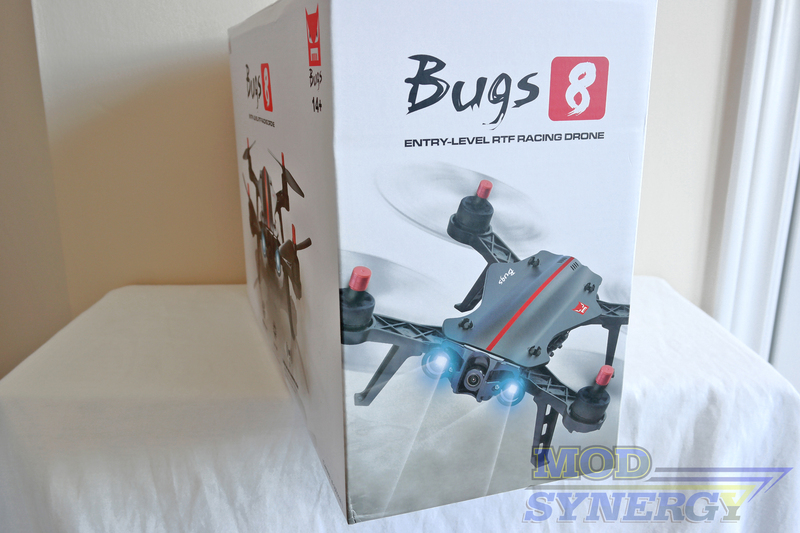 The MJX Bugs 8 250mm FPV brushless racing drone comes packaged in a visually appealing corrugated box with design similar to the Bugs 3, however, I think the Bugs 8 is far superior in the visuals department for its packaging. 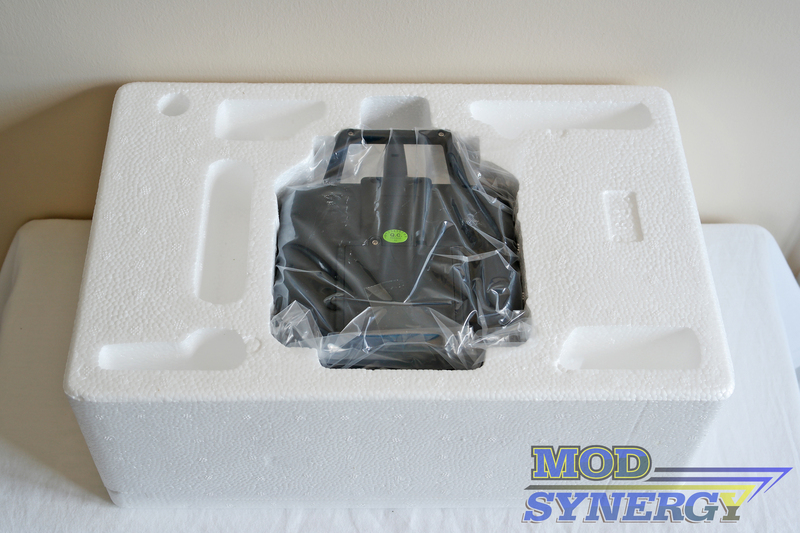 The packaging is compact and contains the same Styrofoam core protecting the contents during shipment, despite the outer cardboard box being a bit weak. The box has a carry handle allowing for easier transport after purchase by the customer. MJX gets straight to the point placing huge photos of Bugs 8 around the package along with the Bugs 8 logo and a bunch of other symbols pointing out a few key features of the drone. The huge photos on the package make it extremely easy to spot on store shelves. 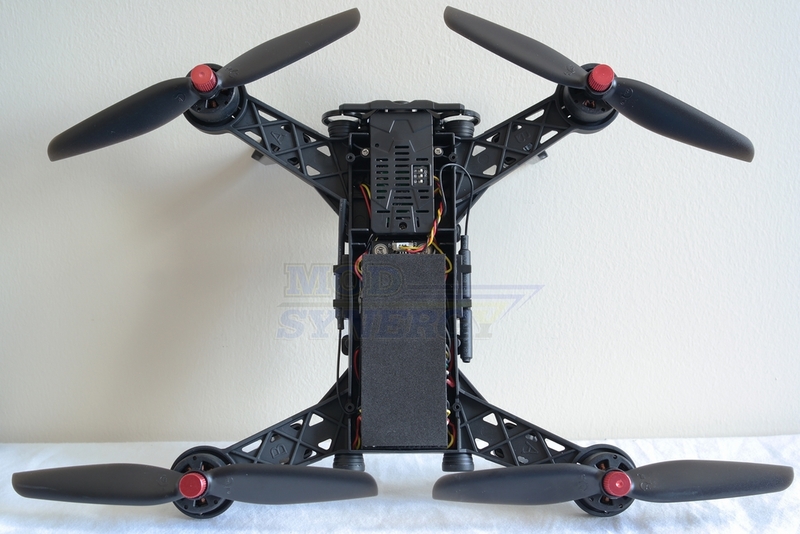 MJX Bugs 8 is a ready-to-fly (RTF) drone package coming with both drone and flight controller. 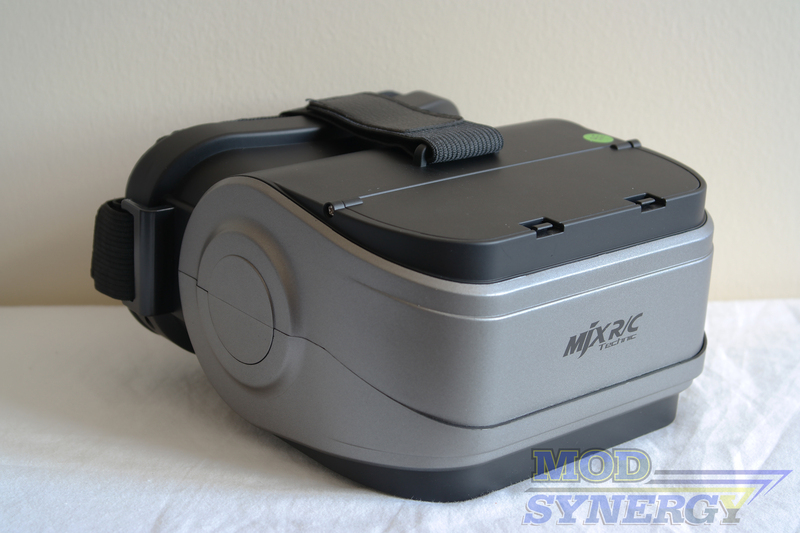 I’m happy to share that this MJX Bugs 8 I’m testing is the top-end complete model, which includes the optional 5.8 GHz FPV monitor, 5.8 GHz FPV camera, along with MJX’s FPV VR goggles, which comes in a separate box. The drone is 99% factory assembled, with only the drone battery needing to be inserted to get up and running. That and by adding 4 x AA batteries into the flight controller. If you also purchase the optional FPV LCD monitor, you’ll have to connect the FPV monitor to either the flight controller or FPV goggles. We’ll go through everything later on in this review. 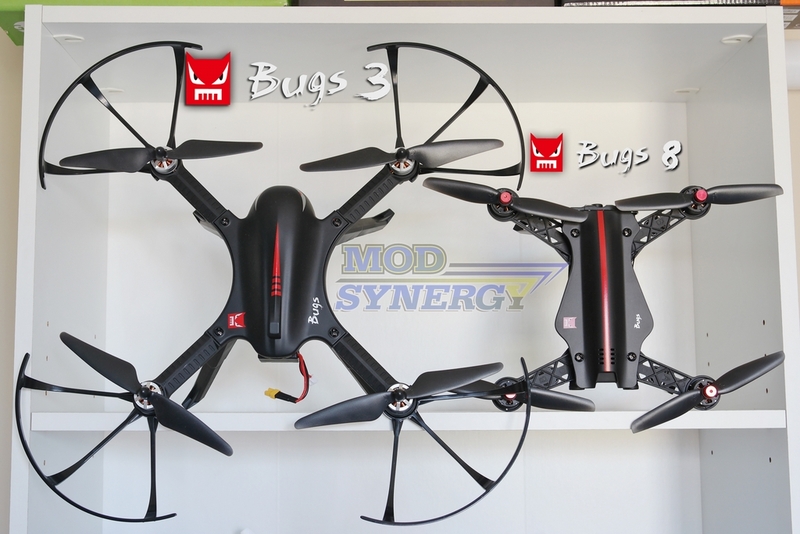 If you haven’t already read my MJX Bugs 3 brushless drone review, which I think you should, I should recap that the Bugs 3 is a larger 310mm drone measured diagonally, versus the new Bugs 8 which measures 250mm diagonally. Racing drones should be lightweight, that much I know since I’m a fan of auto racing and know that being lighter equates to having faster acceleration and better handling, and in the case of a drone, equates to longer battery life. It’ll be interesting to spot differences between the Bugs 3 I recently reviewed, and the new Bugs 8, considering the Bugs 3 isn’t too heavy to begin with and especially when the tall landing gear and propeller guards are removed. The MJX Bugs 8 250mm brushless FPV racing drone is being presented as the best entry level racing drone for beginners, so it’s not surprising that MJX has focused and paid careful attention to how orientation in the air can be made easier for newbies. 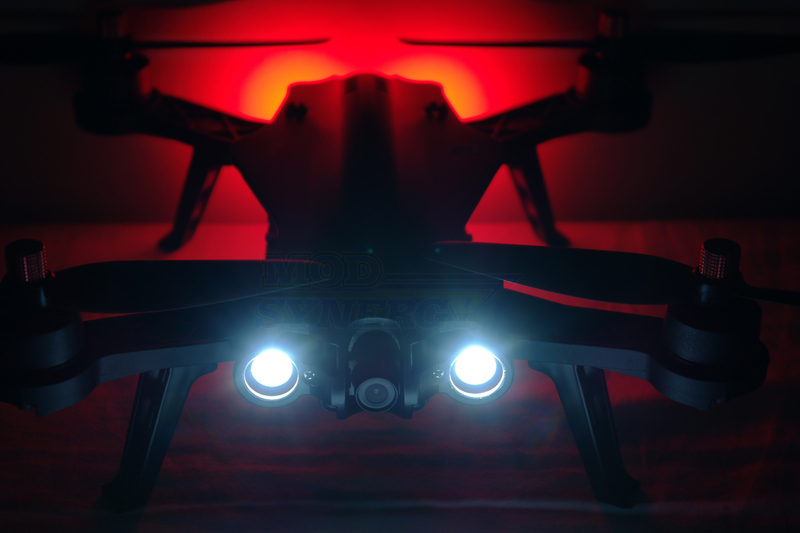 The end result is that the MJX Bugs 8 is the best drone I’ve seen at making orientation very easy for beginners and professionals alike in that they’ve implemented a vehicle headlight and taillight set-up with very bright red LEDs in the rear and white LEDs in the front. Distinguishing the Bugs 8 in the air is no problem. In my opinion, real beginners who’ve never flown drones before should not be flying the Bugs 8 as their first ever drone. I’d suggest starting out on something smaller and then making your way up. 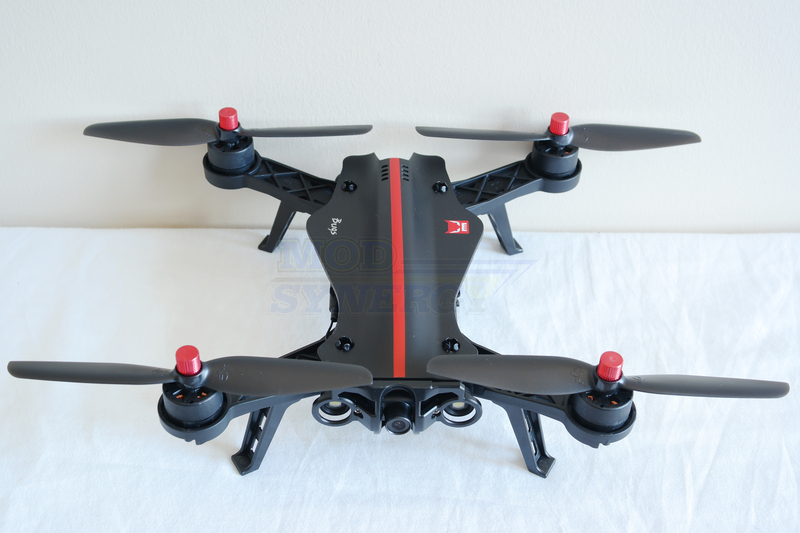 An entry-level FPV racing drone is for those who already have prior experience before making their way up to an entry-level FPV capable racing drone such as the Bugs 8. Further evidence that this is the case, is that MJX includes no propeller guards whatsoever. 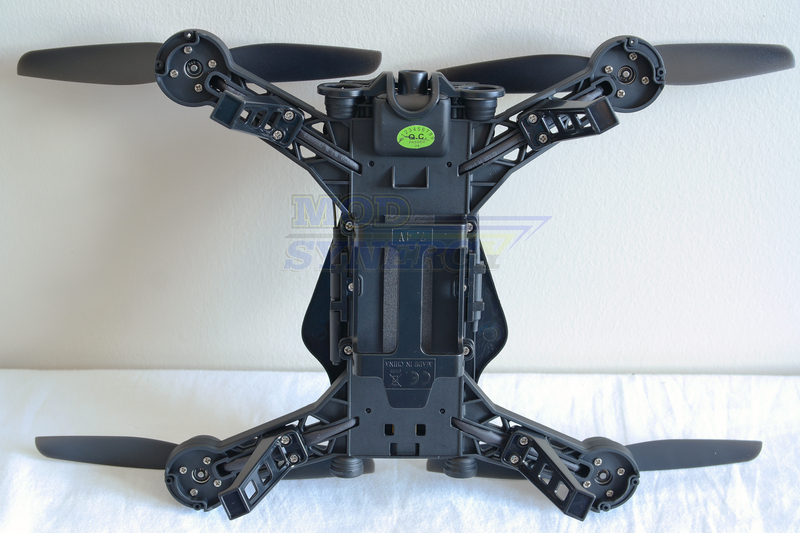 Upgradable and optional parts are shown on the other side of the box and they include the MJX C5830 5.8 GHz 720p FPV camera and MJX D43 4.3-inch LCD receiver display. 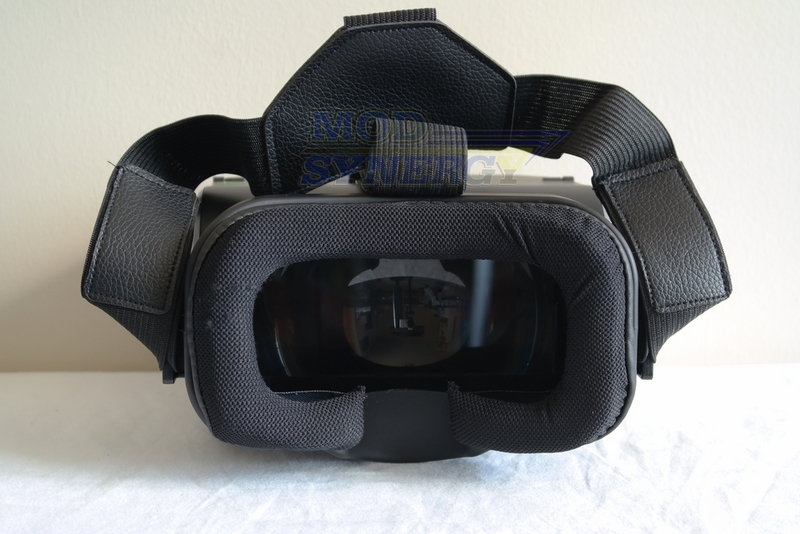 I will be reviewing the complete high-end model with all optional accessories (MJX C5830 5.8 GHz 720p FPV camera & MJX D43 4.3-inch LCD receiver display & MJX G3 FPV VR goggles). Brushless Motors (1806 1800KV): MJX uses powerful brushless motors instead of inferior brushed motors found on the majority of toy grade drones. 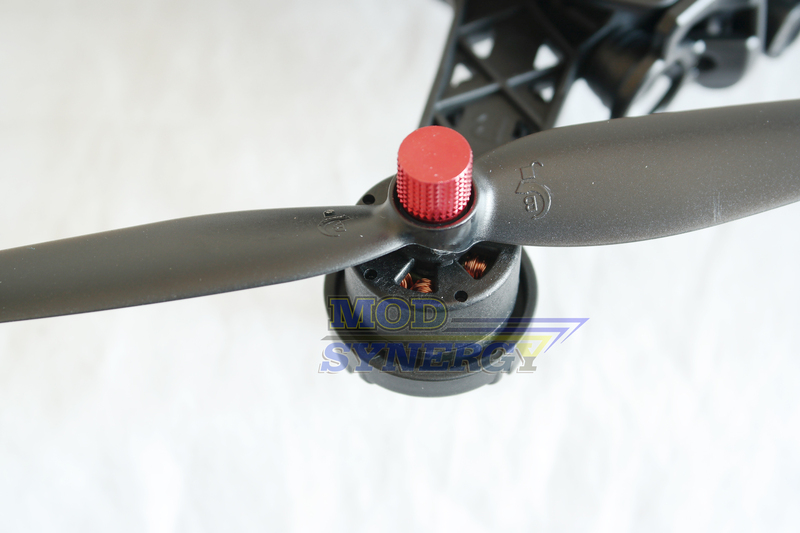 Bugs 8 utilizes the same MT1806 1800KV type brushless motors that are also found on Bugs 3. These motors are advertised as powerful and efficient, having good payload ability, and lastly affordable for replacement purchases. 4-in-1 ESC (Stuck & High-Temperature Protection): Also known as Electronic Speed Controller, these are 99% of the time used for brushless motor set-ups to help convert signals from the flight controller and relay that information to the brushless motors telling them how fast they should spin. ESC's have three wires, one wire is for power, one goes to the flight controllers throttle channel, and the other goes to the brushless motor. So they are all communicating with each other. MJX adds features into their ESC such as built-in automatic lock protection and high temperature lock protection to prevent the ESC from burning out. 2.4 GHz Two Way Communication: No different than most other drones on the market, using this frequency has been tried and tested and allows uninterrupted use without interference from other 2.4 GHz signals nearby. Bugs 3 introduced the weak signal and low voltage remote control alarm feature which turns out to be amazing features to have so I’m happy to see them also on Bugs 8. An alarm will beep a warning through the flight controller indicating when the drone is out of range when flown too far away, and there’s another audible beep alarm that indicates when the battery voltage is nearing low battery status. A new feature is an audible beep tone alarm through the flight controller when the drone’s battery is disconnected. All these audible alarms are excellent features to have and make everything easier for the pilot. 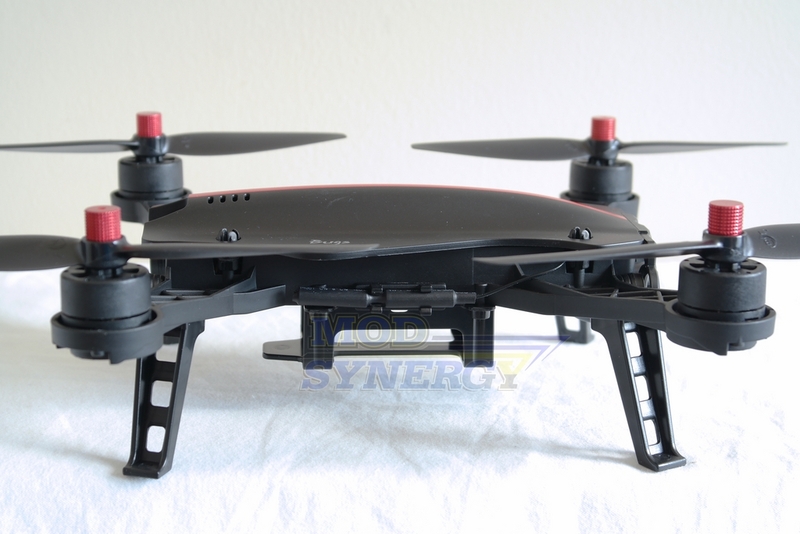 Other toy grade drones have just a blinking LED under the drone which is quite hard to judge while in mid-air. MJX Bugs 8 racing drone contains all of the high-tech features commonly associated with drones such as 4 channels, 6-axis digital stabilization, which uses 3-accelerometers to control and maintain its orientation and 3 more to main stability, despite vibrations of the motors and outdoor elements like the wind trying to throw it off. This helps ensure that anyone can pick up the controller and fly with relative ease since it’s automatically enabled. Bugs 8 can do 360-degree flips in four directions with a push of a button and nudge of the directional stick. Bugs 8 operates in the 2.4GHz digital RF spectrum and is said to have range of between 300-500 meters. This is great if true and we’ll do our best to evaluate if this is possible since Bugs 8 has FPV capability??. 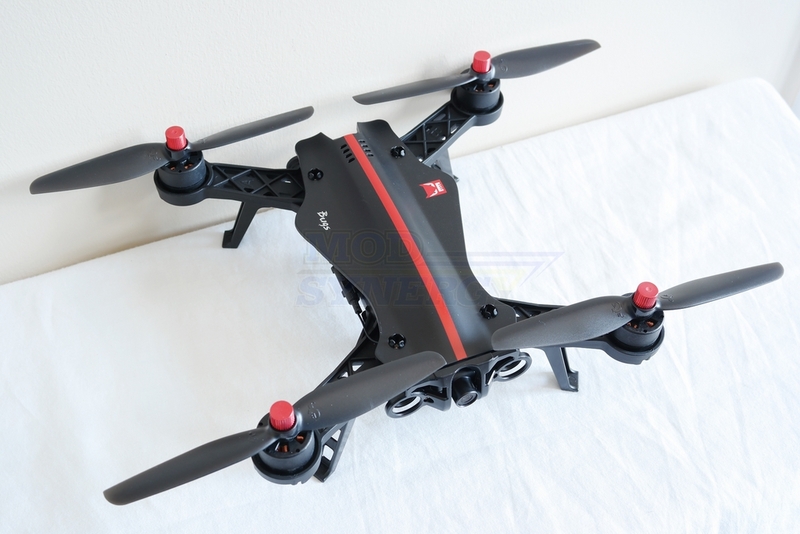 Since the Bugs 8 is billed as a racing drone, it is fitting that it is a manual drone in that it doesn’t have fancy features such as altitude hold, GPS, headless mode, or return to home, one touch ascend and descend. Opening the box you'll find the following items. The bundle is generous. 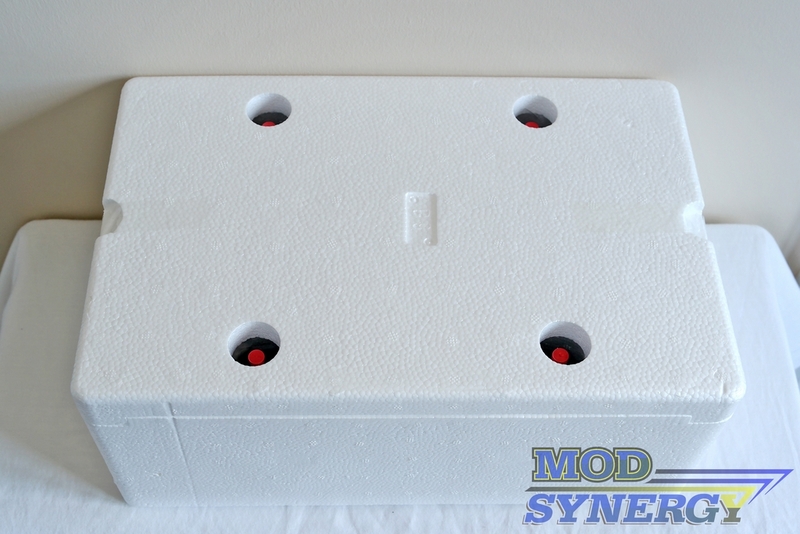 The corrugated box MJX designed does a great job protecting the drone and all components from any damage during shipping because of the use of thick Styrofoam. I had no damage from it being shipped from China to myself in Canada. MJX Bugs 8 comes with a very nice bundle that includes the Bugs 8 brushless FPV racing drone, 2.4 GHz flight controller, 4 x propeller (spares), a propeller end-cap change tool, screwdriver, 4 x washer for propeller, 2 x USB charge cables, 2-3 cell USB battery charger, 2 x 7.4v 1300mAh 25C lithium-polymer XT30 battery, 5.8 GHz FPV monitor and sun visor, stickers and user’s manual. The included charger is a simple one that connects to the balance lead of the battery and plugs into your own supplied cell phone charger for example. A red LED indicates that it has power and another for charging, while a green LED indicates that charging is complete. The charger is faster than the one included with the Bugs 3 (1.5A vs. 500mA) provided you’ve got a fast smartphone wall charger. Given that the included battery is rated for 1300mAh, lithium-polymer batteries can be charged at 1C or in this case as high as 1300mA or 1.3A, so the theoretical maximum of 1.5A is actually a little quicker than ideal. I’d suggest using a smartphone wall charger that is close to 1.5A or if you want to play it safe, use a 5V 1A smartphone wall charger. I love that MJX throws in two batteries in the bundle so there is less down time and more play time. The included 7.4v 1300mAh 25C lithium-polymer XT30 batteries are rated for up to 14-minutes of flight time and this will be verified later on in the review. I love the fact that MJX bundles a full set of replacement propellers with the Bugs 8. This is something that should be included in every drone purchase so people don't have much down time in event of a crash. I've not needed to use any of the spare propellers, but it’s always great to have for those just in case moments. A small screwdriver is included to help with future installs, replacement parts, and or should you wish to run without the short pre-installed landing legs. In terms of build quality and considering the use of plastic construction throughout to keep weight at a minimum, the Bugs 8 feels just like the Bugs 3 in that it is very strong. MJX uses the same pure nylon fiber material that was used for Bugs 3 in the top canopy for Bugs 8, which allows for bendability while having strength for impact. The top canopy is very flexible, more so than the one on Bugs 3. Since the body is more compact than Bugs 3, everything feels tighter and rigid, and obviously more so than normal toy grade drones I've tested. 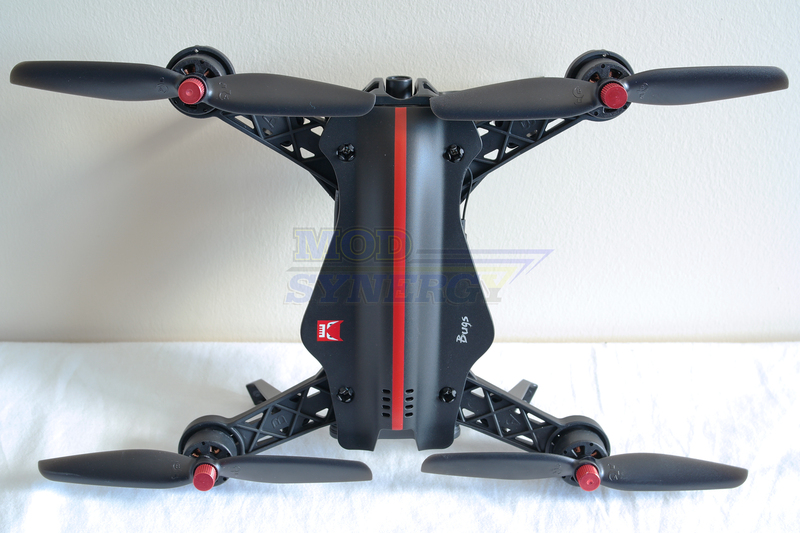 The matte finish is excellent and there’s no defects seen around the body of the drone. Fit and finish is excellent. 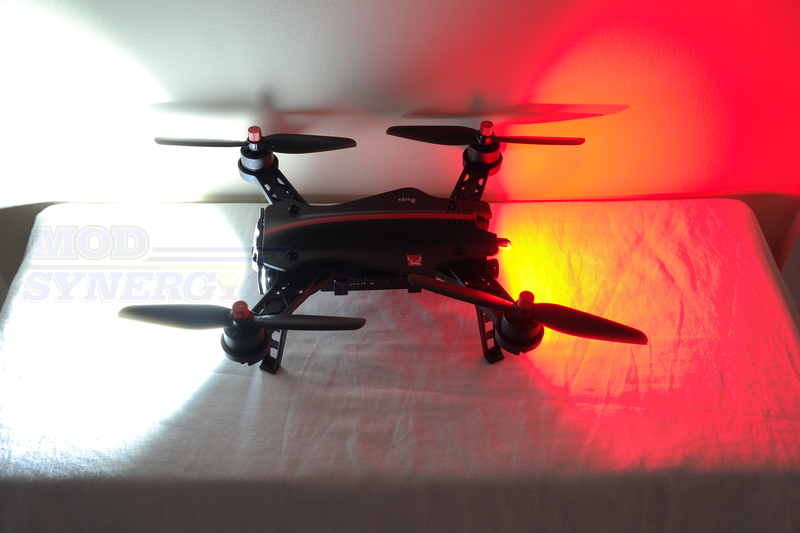 As you’ll see from the photos in this review, especially the ones taken when Bugs 8 is powered up and running, and after seeing the LED light show in action, I have to say that Bugs 8 is easily the most aggressive looking and sexiest looking drone I’ve seen for some time. It holds the same type of uniqueness that was found in Bugs 3, but in a smaller meaner package packed with aggression and a futuristic sleek flair resembling that of a racing inspired look being so close to the ground. 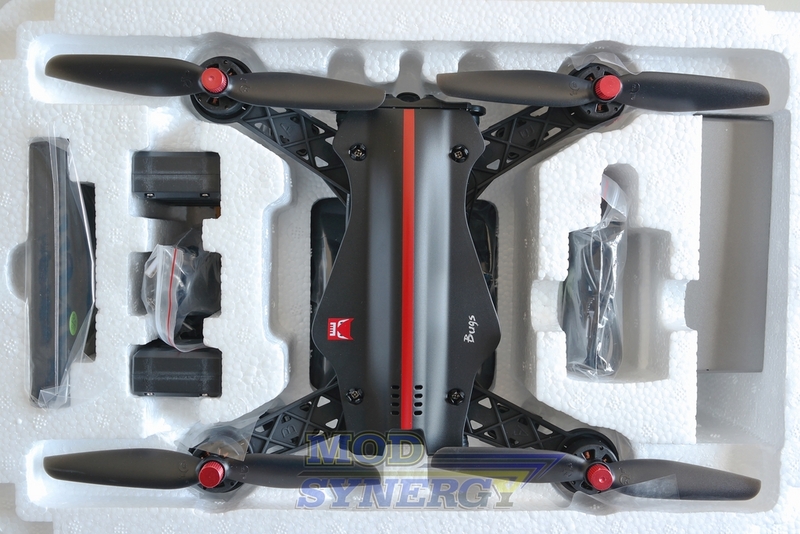 According to the marketing materials and specifications in the user’s manual and on the packaging, the Bugs 8 racing drone utilizes the same MT1806 1800KV type brushless motors as was used on the physically larger Bugs 3. Now inspecting the actual motors on Bugs 8, they look visually different than the ones found on Bugs 3. Aside from Bugs 8 motor being inside a black color metal casing and the Bugs 3 being in a silver metal casing, the Bugs 8 motor diameter is 1.00” while the Bugs 3 motor diameter is 0.92”. Other differences to note are casing of the Bugs 3 motor curves upwards to the propellers while the casing on Bugs 8 motor is flat. They appear to be using the same MT1806 1800KV type brushless motors, but are definitely from different manufactures so it’ll be interesting if it’s possible to feel differences. Propeller differences between Bugs 8 and Bugs 3 are that the propeller length on Bugs 8 is 6” versus 7.5” for Bugs 3. This is not surprising since Bugs 3 is a 310mm drone while Bugs 8 is a smaller 250mm drone size. Pitch angle appear similar between both propellers, but the propeller design on Bugs 3 is different in that the blades continue straight through to the other side of the propeller, while the blades on Bugs 3 propeller has more of an angle and gap around the center of the blades. Bugs 8 is not a camera drone that Bugs 3 was. Both are separate classes of drones as evidenced by the physical size alone. One was a larger camera bird and the other is a smaller more aggressive entry-level racing drone and therefore there are no camera mounting options on the Bugs 8 aside from the FPV camera pre-installed from the factory. Styling wise the MJX Bugs 8 lives to the Bugs moniker looking like a buzzing dragon fly from a distance. Looking directly at the front we find the face of the Bugs 8 where the two LED lights are the eyes of the drone, the FPV camera the nose of the drone, and the plastic guard that overlaps the shield of the drones face rounding out with the mouth and head of the Bugs 8. Further styling is provided by red anodized aluminum end caps that secure the propellers into place when screwed down. A plastic tool is included to remove these red end caps if for some reason you can’t remove them with your own hands. Each cap has a nice grip diamond pattern so there shouldn’t be issues removing these provided they aren’t over tightened. The 5.8 GHz FPV camera that sits at the center can be tilted up and down and has different positions that it can lock to. You can see the ribbon cable that connects to the camera lens when the camera is pointed downwards. The very bright white LED headlights and red taillights are covered with individual lenses for protection. Night flights are possible with these very bright LED’s and orientation will not be an issue. Bugs 8 have the ability of turning off the front headlights if you desire, all you do is hold down the left speed mode button for two seconds. The rear taillights are not possible to disable during flights and remain on until the motors are disabled by the flight controller. I suppose this is for safety purposes and I’m totally fine with this. Turning off the front headlights during the day will save you some battery power and provide you some extra flight time. Bugs 8 has both 2.4 GHz and 5.4GHz antennas mounted on the exterior of the drone, each on both ends of the battery compartment bay, and are covered with heat shrink wrap for protection. This follows the same design language seen on Bugs 3 and makes for great distance during flight. MJX says it’s possible for the Bugs 8 to reach between 300-500 meters. 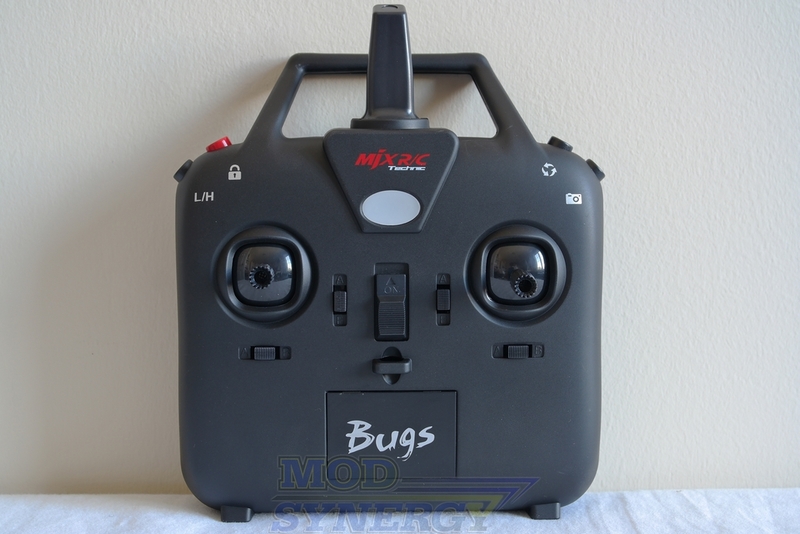 The MJX Bugs 8 follows the same path as Bugs 3 and incorporates the lithium-polymer battery inside a plastic enclosure which is inserted and slid into the battery bay of the drone. A piece of foam lies against the battery cage to ensure snug fitment of the battery to prevent it from falling out during flights. Other toy grade drones in the past have their battery completely exposed on its own with no enclosure. This one is enclosed in a shell to abide by new drone rules regarding battery safety. 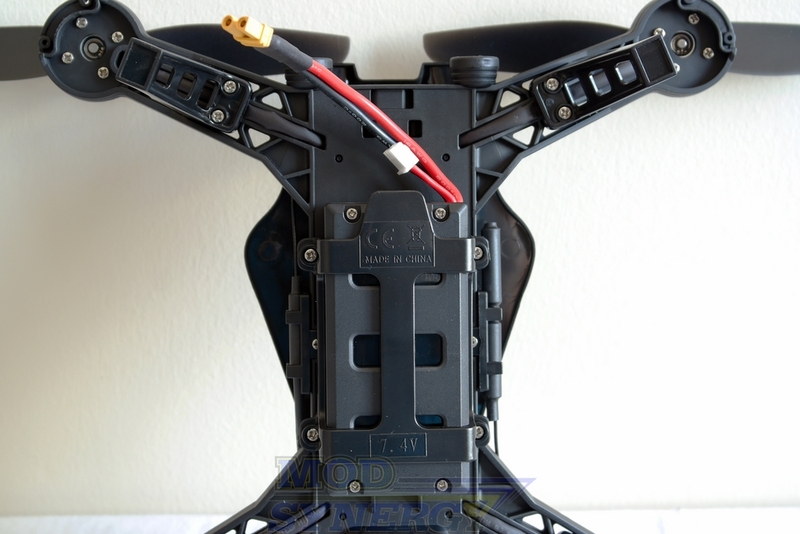 The battery connector is different from the usual JST and micro-LOSI connectors on small drones. 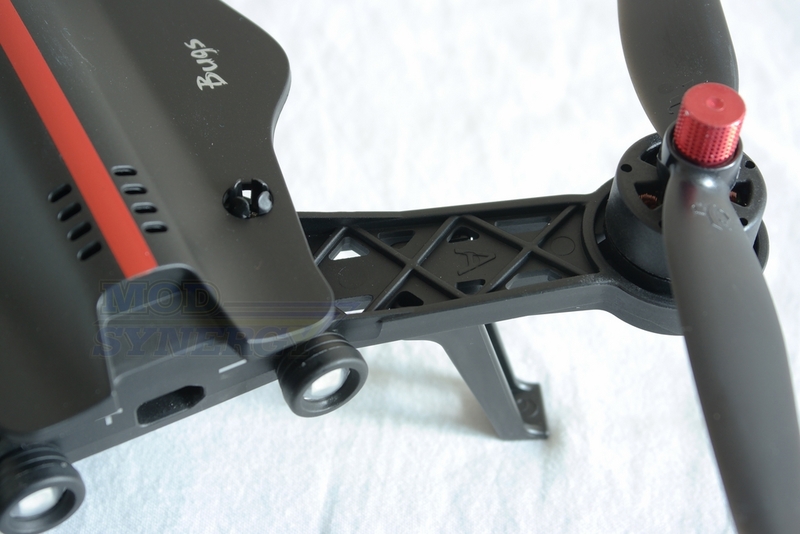 Bugs 8 utilizes the new smaller XT30 connectors which are a heck of a lot better to use than the ones already stated on other toy grade drones. XT30 battery connector is easier to remove and insert, fits only one way, and are fool proof. I’m already familiar with the larger XT60 connectors so these are tried and true in the industry but just in a smaller scale. A small negative regarding the power on and power off of the Bugs 8 is that it contains no power switch. I'd love a dedicated power switch than having to insert and remove the battery connector each flight, but it’s just not offered. The larger Bugs 3 drone I previously tested was marketed as having a flight time of up to 19 minutes with its 7.4V 1800 mAh battery. Unfortunately MJX was too optimistic about their battery life claims and in reality it only offered approximately 12-13 minutes during my testing, depending on the configuration of the drone. This time around with the Bugs 8, MJX says it’s possible to achieve up to 14 minutes of flight time with the physically smaller and lighter Bugs 8 and the new 7.4v 1300 mAh battery. Later on in the review I will validate if we can get these flight times despite the FPV camera drawing additional power from the battery. A conventional flight controller is included with the MJX Bugs 8 brushless FPV racing drone using the 2.4GHz wireless band. The Bugs 8 flight controller is the same exact one bundled with the Bugs 3 drone, except that this time around the four buttons at the top are now labeled with symbols so the pilot doesn’t have to remember what each button does, and that the controller is black instead of white as with the Bugs 3. This flight controller is compact in size for the style of flight controller. I've used others with the same style but was physically larger. I like the compact feeling because my hands aren't large to begin with. The only negative thing I can say about this flight controller is that the plastic construction is too smooth and needs more texture to grip. Some other flight controllers have plastic dimples to act as grip for your hands. MJX should have something similar or could have at least included strips of anti-slip tape so you could place it wherever you desire. The controller is simply too slippery and smooth for my liking, especially after extended periods of flight, so I'm going to put my own anti-slip tape. This flight controller is something I've come to enjoy because it allows the pilot to fly with ease. The best flight controllers are the ones that allow the pilot to focus on flying and not having to fight against the flight controller. 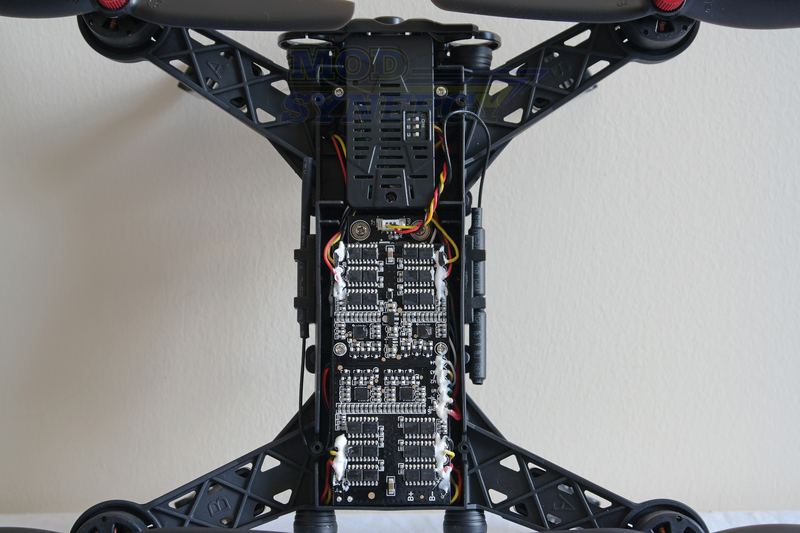 A poorly designed flight controller takes away from the overall experience of the drone. Aside from being a bit too smooth and slippery, but still manageable, the Bugs 8 flight controller has very good ergonomics and is very comfortable in the hands. I’ve noticed that the analog flight sticks have more range of motion than some other flight controllers I've used, which I say is a good thing. The spring loaded tension for the analog stick is weighted perfectly to give smooth execution of maneuvers. The flight controller is powered by 4x AA batteries and weighs 294 grams or 0.648 LBS in flight configuration. There's a handy carrying handle at the top of the flight controller and there's a handy lanyard hook just below the power switch in which you’re able to mount around your neck. Unfortunately you'll have to supply your own neck lanyard. The flight controller is lightweight enough that it does not make your hands feel tired after extended period of flight. Construction wise the controller utilizes thick plastic which feels high quality and if you were to ever drop it, I'm sure it would survive. I like that there are slight recessed areas where your middle, ring, and pinky finger will rest and wrap around underneath the flight controller, but as I said before, the plastic becomes too slippery and needs more grip. The flight controller has two analog sticks that protrude upwards making it useful for both thumb and pinch flyers to use. I like how the tips of the analog sticks have cuts and grooves in them for extra grip allowing thumb flyers to use it without fear of slippage, while pinch flyers have grips on the inside of the stick pods. The movement of the right analog stick is excellent offering equal amounts of spring loaded tension, and the flight controller feels like it has more range of motion to work with allowing the pilot to make linear and progressive movements. This makes for more precise flights and less touchy throttle or sensitive reactions on sticks with limited range of motion. This allows the pilot to hover easier on Bugs 8. I’ve had no weird defects or signs of any button or analog stick becoming stuck at different angles, it all has been a positive experience. Good flight controllers like this one allow you to find the sweet spot for a good hover, where you can essentially not have correct as much in the air (when in calm weather) and it'll stay in the general vicinity without ascending or descending on its own to a large degree. This is easier to achieve on Bugs 8 because there is no spring tension in regards to the analog throttle stick, but only spring tension for pitch movements. When powered on, a green LED is illuminated just below the red MJX logo. The left analog stick is the throttle (up/down) and yaw (spin-left/right) stick. The right analog stick is the pitch (forward/back) and roll (left/right) stick. Surrounding both analog sticks are their respective trim buttons having ability to trim throttle/yaw and pitch/roll, if you find the drone is leaning to a certain side on its own. Simply press the respective trim button once or more times in either direction to make it centered. A long beep indicates that the particular trim is neutral center. A single red button at the top of the flight controller is not an emergency button, but rather the button used to lock or disarm the brushless motors from operation. To bind and pair the flight controller to the drone, make sure the throttle stick is completely down, hold the red button while turning on the power switch. Two audible beeps and blinking green LED indicate that the flight controller is in bind/pairing mode. Now connect the battery to the Bugs 8 and the flight controller will automatically bind to drone. 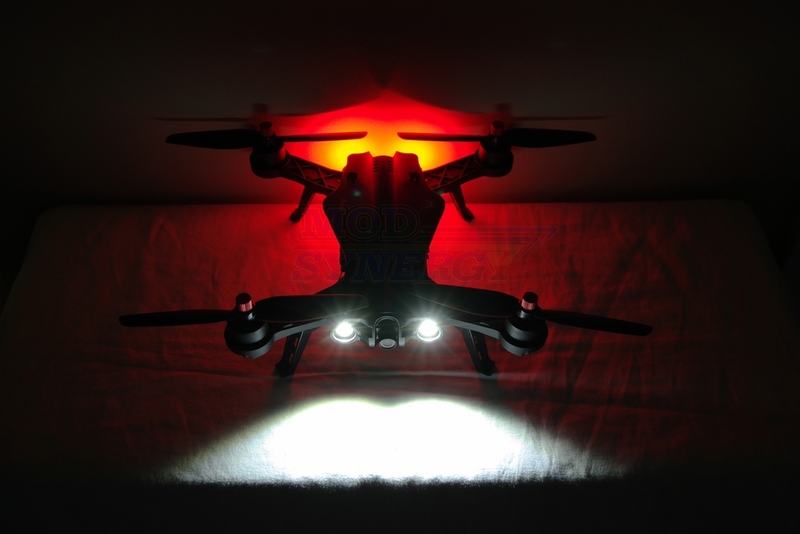 The once blinking green LED will become solid indicating a successful pairing of drone and flight controller. The button on the left of the lone red button cycles between low and high speed modes and is indicated by an audible tone beeping once or twice. Low speed is one beep and high speed mode is two beeps. Additionally, if this same speed mode button is held down for two seconds, it’ll power off the drone LED headlights saving some battery life in the process. The button to the right of the handle is the 360 degree flip mode button. This is so much fun to see in action. I would advise not to flip in bad weather or else things can possibly go wrong. To execute a 360 degree flip, simply hold the flip button down and nudge the pitch and roll stick (right analog stick) to whichever direction you want to flip, and the drone will flip on its own. 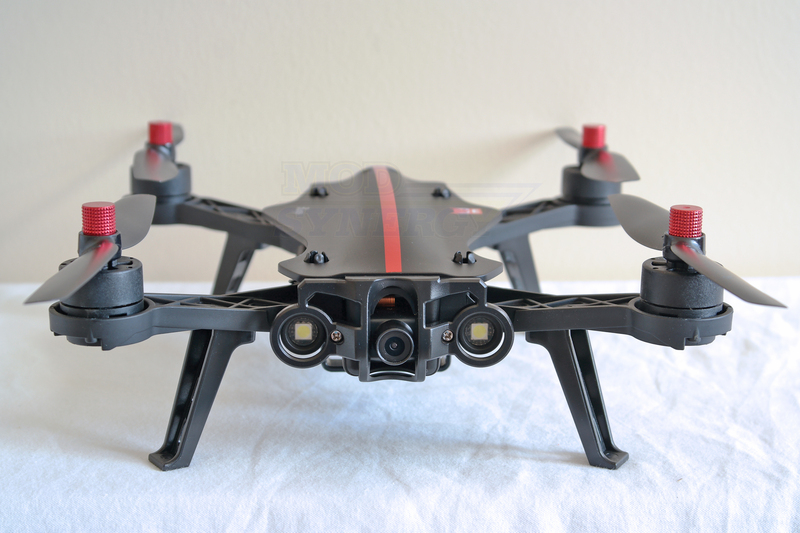 The flight controller has an audible warning tone for situations when the flight controller is turned off while the drone is still connected to the battery. You have to either turn on the flight controller or remove the battery for the constant beeping to stop. The flight controller has an audible warning tone for when the drone is flying too far away from the drone indicating that you should come back closer. The flight controller has an audible warning tone for situations when the drone battery has entered low voltage status indicating and giving the pilot time to land safely. Note: When the flight controller is turned off, and the motors are still operational, the drone will shut off power to the motors in about 2-3 seconds. The MJX C5830 5.8 GHz 720p FPV camera comes pre-installed when you purchase the high-end Bugs 8 model such as the one being reviewed today. 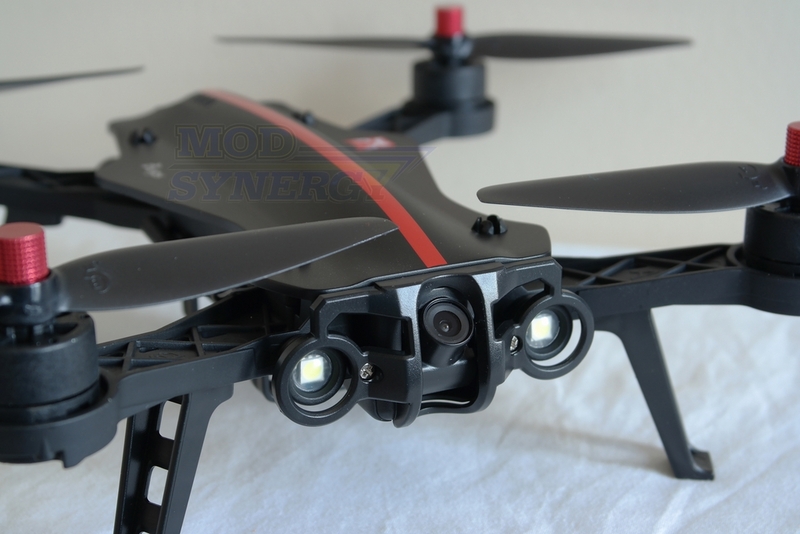 MJX produces a variety of cameras for their drones and this C5830 in particular is their 720p FPV camera operating in the less crowded 5.8 GHz spectrum. The 5.8 GHz cameras are more expensive than 2.4 GHz cameras. Why should one choose a 5.8 GHz camera over 2.4 GHz? The reason why it is best to purchase a 5.8 GHz camera to be used with your 2.4 GHz drone, is so that both camera and flight controller are not competing for the same 2.4 GHz signal, which would cause interference and significantly affect and cut the maximum distance that you can fly. 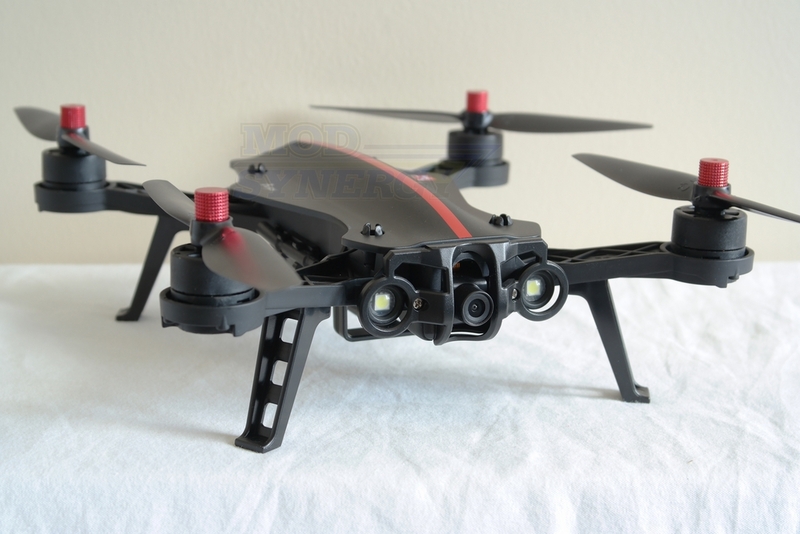 Why other toy grade drones use both 2.4 GHz for camera and drone is simply cost related and simply more inexpensive. Let’s take a look at the FPV camera shall we? 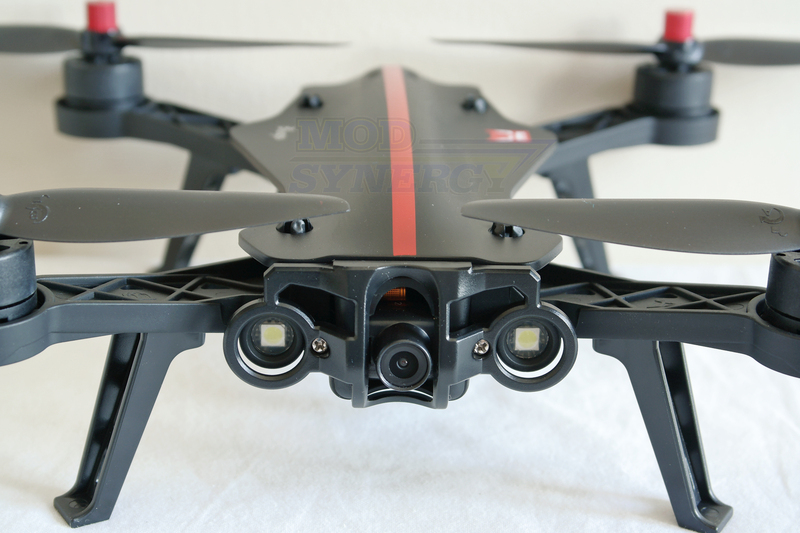 When the pure nylon fiber canopy of the Bugs 8 FPV racing drone is removed, the MJX C5830 5.8 GHz 720p FPV camera is seen mounted towards the front of the drone, just above the large rectangular ESC board. Obviously there is no need for you to open up the canopy if you have the camera pre-installed, but for purposes of review I’d like to point out that the FPV camera retrieves power from the receiver board that sits below the ESC board. The 5.8 GHz antenna is then routed out of the drone beside the battery compartment. Since we’re already looking at the innards of the Bugs 8 racing drone, I’d like to give kudos to MJX for having PCB’s that are obviously machine soldered and not done by hand, and that every wire that is exposed is covered and therefore protected by potential shorts and or liquid. A foam insert is placed on top of the ESC board to protect the PCB when the canopy is on top. MJX makes connection to the C5830 5.8 GHz 720p FPV camera very easy. There is no setup required. 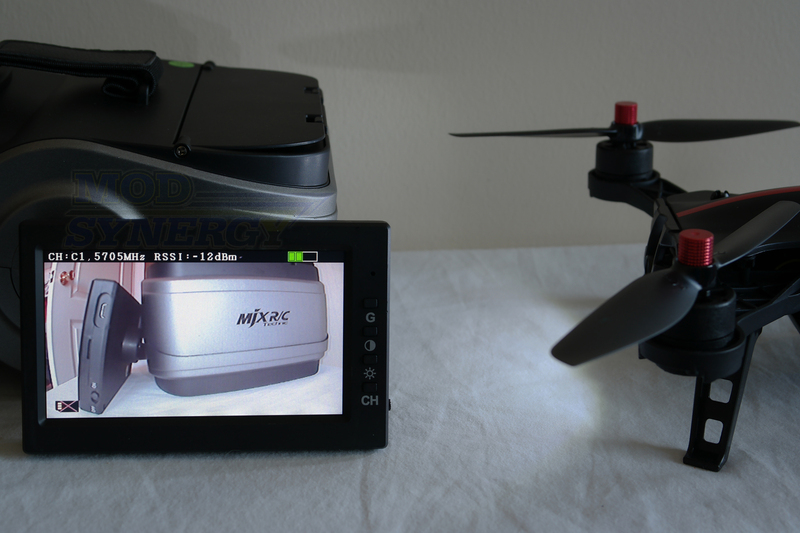 Once the drone is on, the FPV camera is automatically shooting and transmitting video wirelessly to be picked up by the receiver, in this case the MJX D43 4.3-inch LCD monitor. Please keep in mind that the C5830 5.8 GHz 720p FPV camera has no association with a smartphone app. You do not use your iPhone or Android smartphone to work with this camera; the FPV is completely independent and does not have an SSID being broadcasted that needs to be connected to. 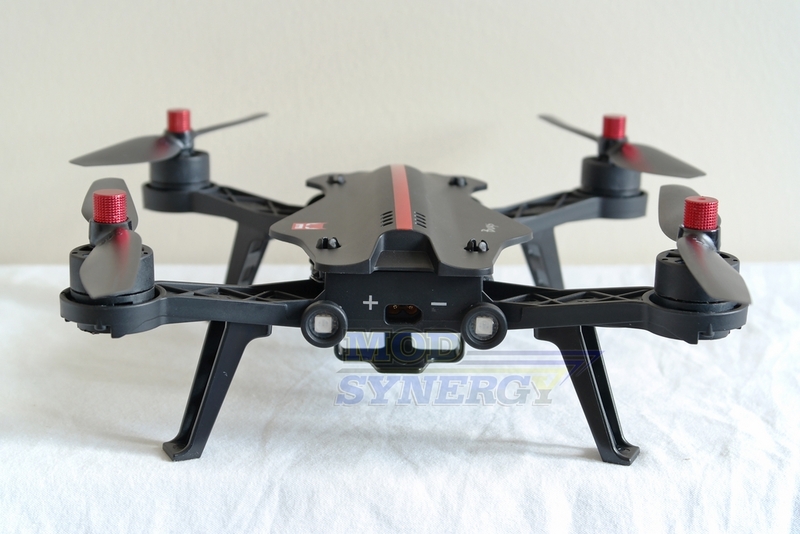 All the pilot needs to do is simply power on the Bugs 8 racing drone like you normally would and the FPV camera is up and running immediately. 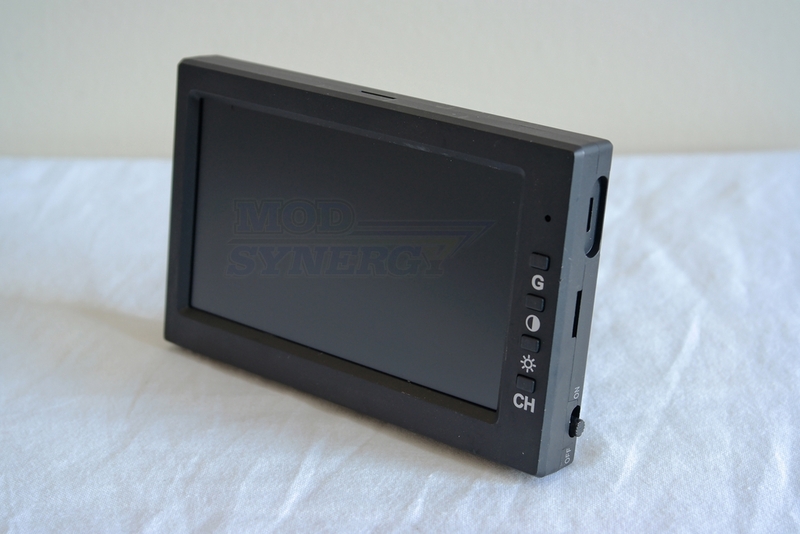 At this point you would cycle through the 5.8 GHz channels on the optional MJX D43 4.3-inch LCD monitor, which is essentially the receiver, to eventually find the specific channel the FPV is transmitting video to. You will know when you’ve found the correct channel the FPV camera is transmitting to when the picture on the screen is not fuzzy but sharp and clear. 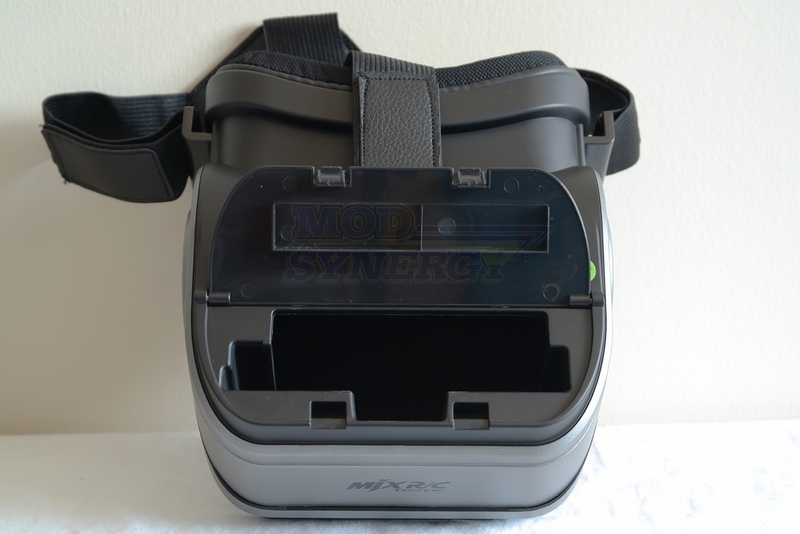 The MJX G3 FPV VR goggles measure approximately 16 cm x 16 cm x 9 cm or 6.3” x 6.3” x 3.5” (LxWxH) and weighs in at 273 grams or 0.6 LBS specifically designed to fit the MJX D43 4.3-inch LCD monitor. 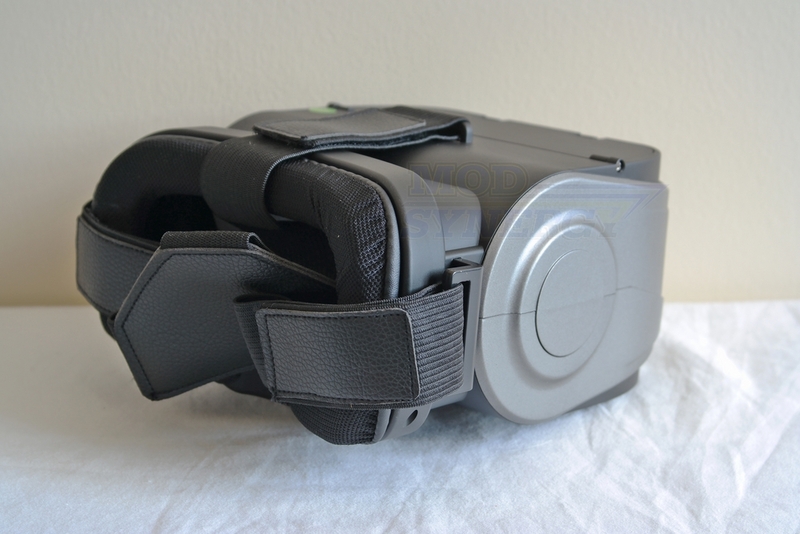 The straps have Velcro on them so the user can adjust the fit to his or her head shape. There’s a thin layer of padding for the strap that rests behind your head. The foam padding that rests against your eyes is a little bit thicker at approximately 10mm, but is still really soft compressing easily once you’ve put on the goggles over your head. I think I would have liked an even thicker piece of foam for surrounding the face. 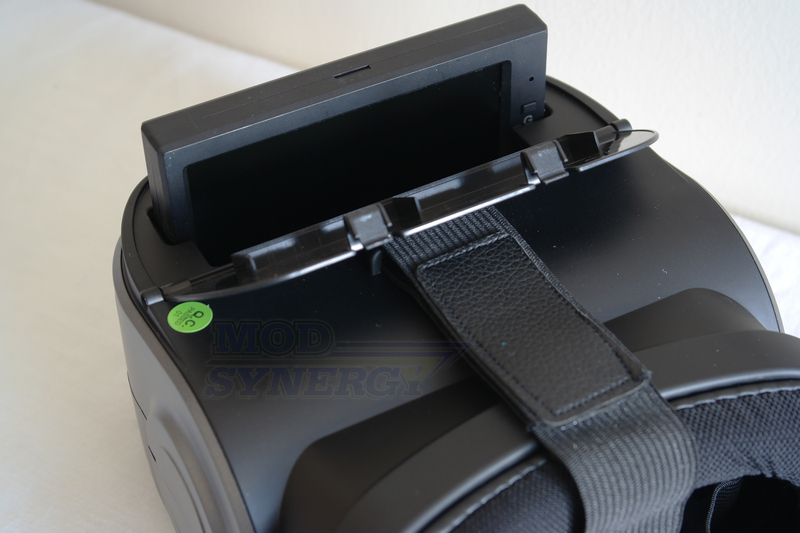 Simply pop up the top cover and slide in the screen upright down the slot with the ball joint mounting system towards the front of the FPV goggles. 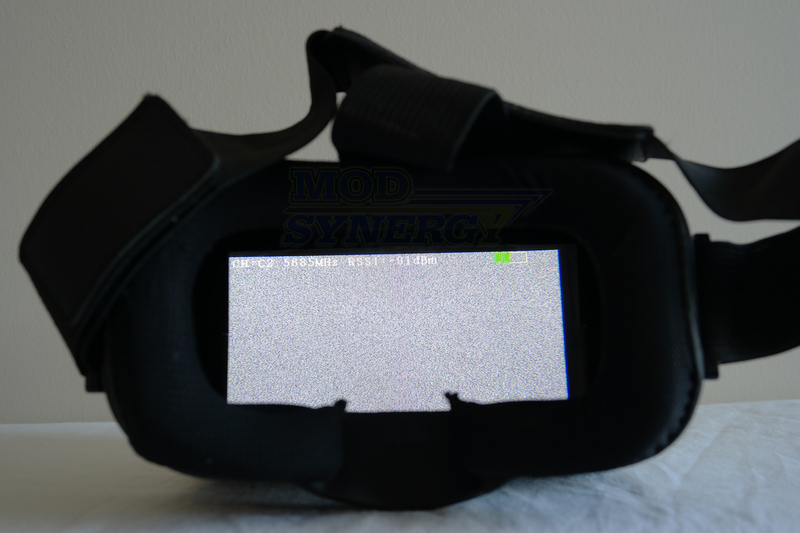 Please note that you must turn on the power to the D43 4.3-inch LCD monitor before placing it inside the FPV goggles as there is no way to power on inside the goggles. 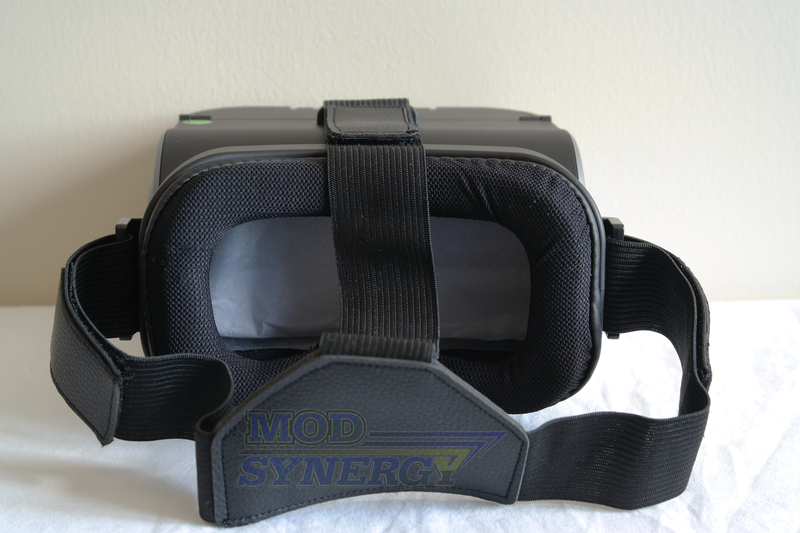 With the D43 4.3-inch LCD monitor slotted in at the top of the MJX G3 FPV goggles, the weight increases to 384 grams or 0.85 LBS, so the user must make sure the straps are tight enough to ensure the goggles don’t droop and slide down. The bottom of the FPV goggles has what appears to be a ventilation hole, but these are fake and just for show. 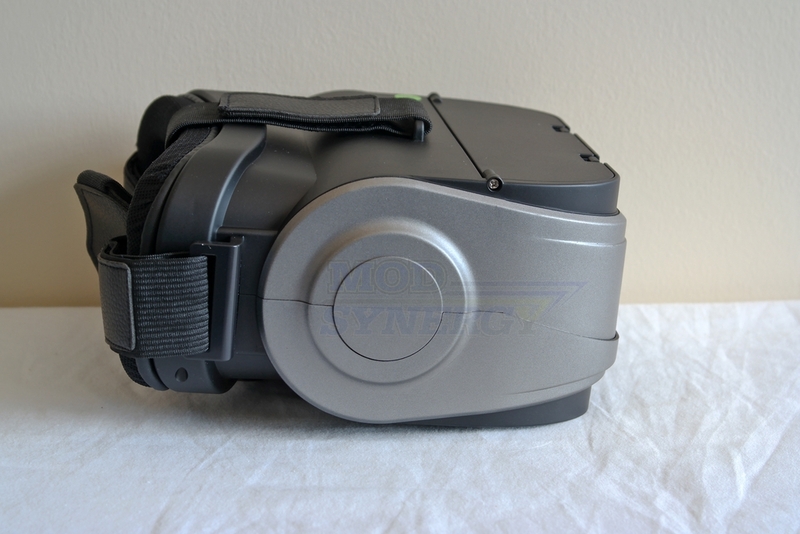 These goggles require no battery to operate and no wires to hook up to the D43 4.3-inch screen. Looking through the goggles we find a plastic Fresnel projection lens which sits approximately 5 cm from where your eyes will be resting and is used to decrease the minimum distance between your eyes and the D43 4.3-inch screen while making the 4.3-inch screen larger than it actually is. The Fresnel lens is made out of plastic and since I don’t have experience with FPV goggles and different types of Fresnel lenses, I can’t particularly say if these are the best, but what I can say is that I believe what is provided is adequate to get started and projects a reasonably clear image for the most part with some minor annoyances and things to look out for. It really depends on the person and how they feel looking through a lens. The Fresnel lens magnifies the image like a magnifying glass does to paper so you have that sort of effect. I notice the image is relatively clear overall, but I do notice some softness as you scan towards the edges of the screen. I notice some light flaring/reflection and slight halos due to the brightness of the screen. I suppose it’s either the Fresnel lens that doesn’t have much AR-coating or to minimize this effect, one needs to lower the brightness of the monitor. Needless to say, if you haven’t flown FPV before like I have, it takes some time getting used to and you may or may not experience some motion sickness or will have a hard time adjusting your eyes through a Fresnel lens. So this is highly YMMV (your mileage/results may vary). The only thing negative I saw out of the box was that the cushion already had a slight tear of material. 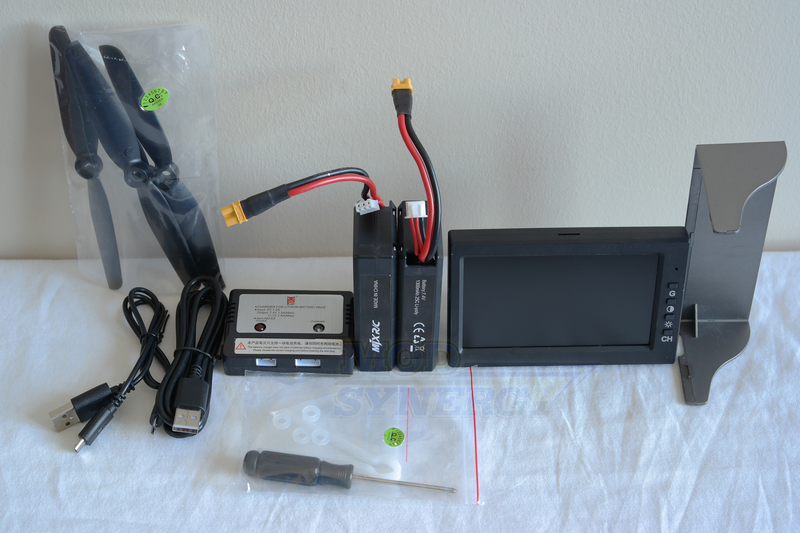 The MJX D43 5.8 GHz 4.3-inch LCD monitor is the receiver of the MJX C5830 5.8 GHz FPV camera on the Bugs 8. It weighs 111 grams or 0.24 LBS and measures 4.65” x 0.62” x 2.96” or 118.1 mm x 15.74 mm x 75.18 mm (L x W x H). The exterior is painted black to match the black flight controller and there’s a screen protector film you must remove before use. 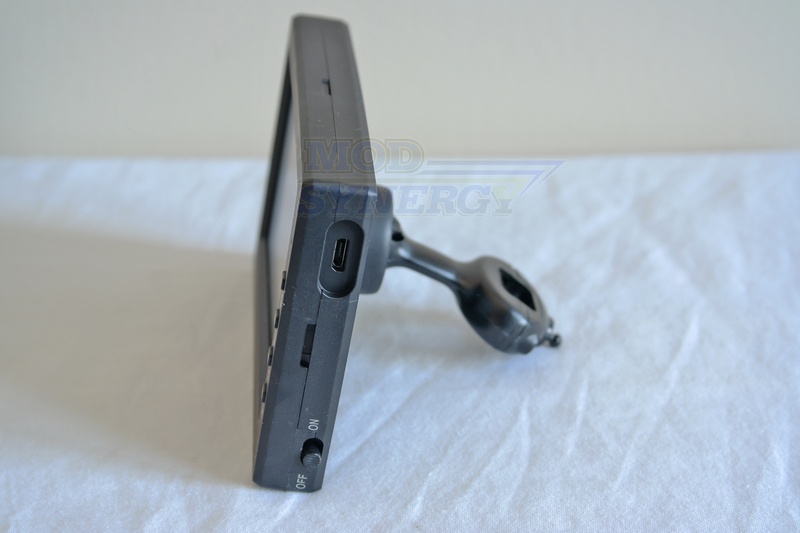 The rear of the monitor has a mounting system that uses essentially a ball joint to place the D43 LCD monitor to the flight controller. Once on the controller you can move and adjust the monitor to different positions and to your liking. 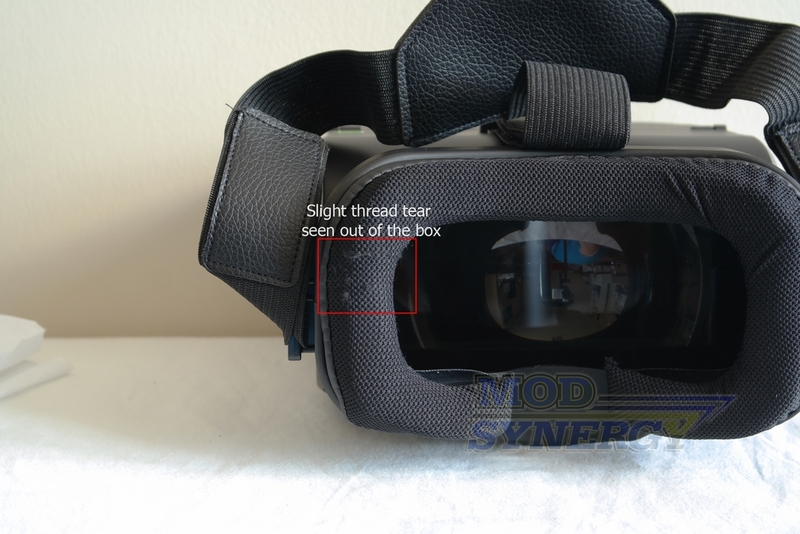 If you prefer to use the MJX G3 VR goggles, simply remove the ball joint from the rear of the monitor before placing it inside the MJX G3 goggle. The screen itself has a matte finish and is not glossy. I think once placed inside the goggles, you’ll agree that the matte screen finish was the correct choice to go with. Unfortunately with all matte LCD displays, you may find that in direct sunlight it may be hard to see the image on the screen. The D43 does a decent job in direct sunlight but it’s not the brightest screen on the market considering this is an entry-level racing drone and the price reflects that. The screen is basic in that it is using a TFT TN panel and not an IPS panel. So the compromise between a TN panel compared to an IPS panel is that TN panels have better response times and in this case works better for FPV racing as lag and or image ghosting is kept to a minimum. The compromise that a TN panel gives up to an IPS panel is that the viewing angles are much more limited and the color reproduction can be considered flat compared to an IPS panel. 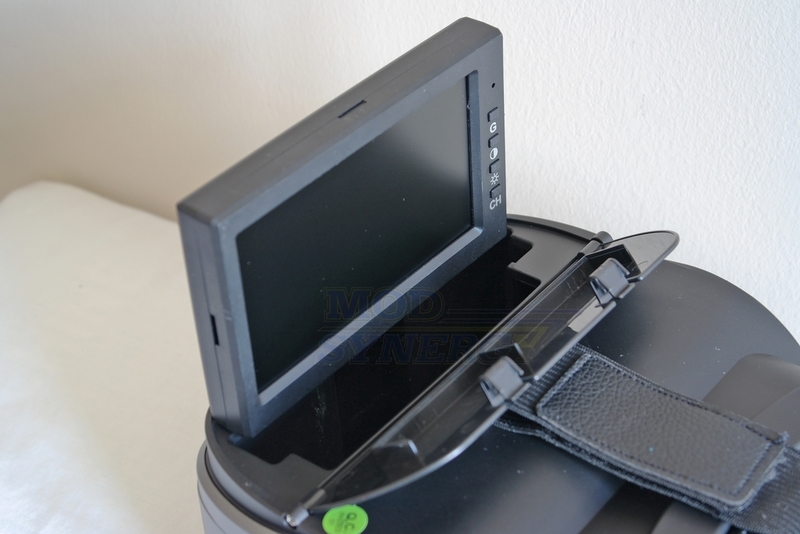 So once the D43 LCD monitor is placed on the flight controller and you’re outdoors in a sunny day, you may find the screens brightness and contrast might not be great enough to overcome how dim it may appear outdoors, but thankfully MJX bundles a plastic hood that goes over the screen to block out the sun and provide you with a easier to see image. The ‘sun visor’ snaps into place in three corners of the monitor’s bezel. To the right of the screens bezel we find from top to bottom a red LED charge indicator, the G button which enables on screen visual indicators, the brightness button, the contrast button, and the channel cycle button (channels A-D with different frequencies). The right side of the screen contains the micro USB charge port and an on/off power switch at the bottom. It should be noted that whatever 5.8 GHz channel you are in, that same channel will remain during power down and for the next time the screen is powered back up. The same holds true for both brightness and contrast settings, the internal battery keeps these settings in memory. 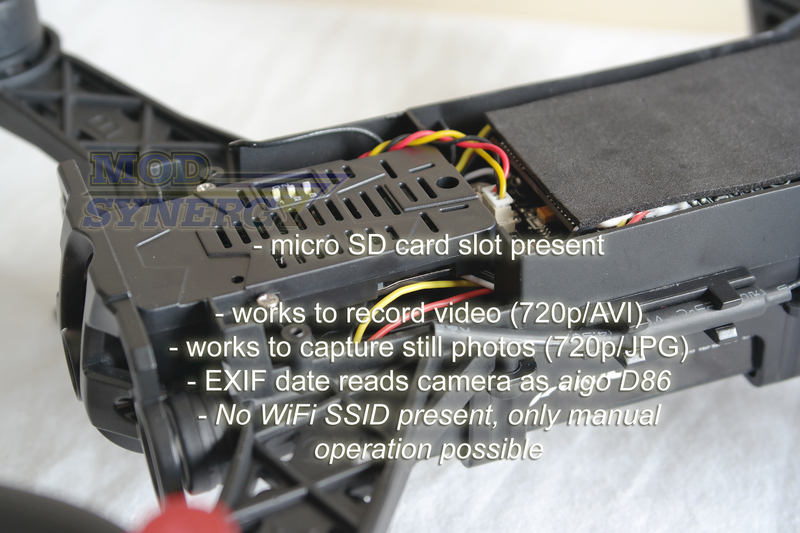 (Optional) MJX C5830 5.8 GHz 720p FPV Camera -- Unoccupied micro SD Card Slot Works! 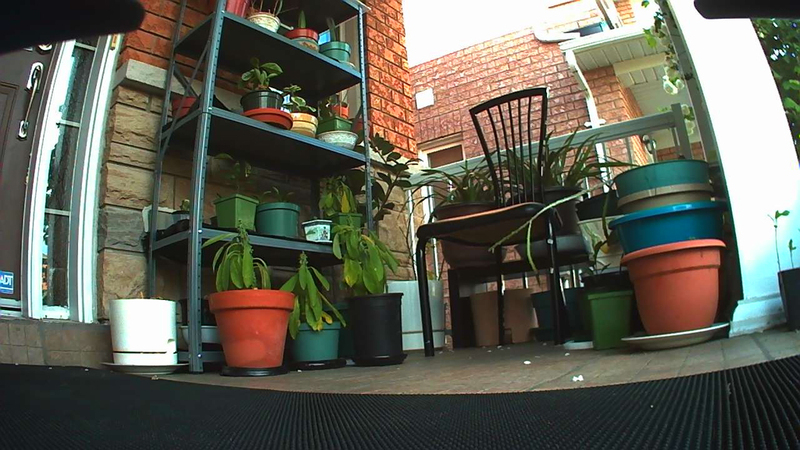 To test if the video recording and still photo capabilities worked, I proceeded to tap once on the camera button on the flight controller where I noticed a red circle flash once on the screen. I guess it means that it is working? That red circle which flashed once indicated that a still photo was taken and once I held the camera button on the flight controller for 2-3 seconds, a time counter starting ticking upwards indicating it was now recording video…sweet! I needed to verify that everything was indeed working and saving to the micro SD card, therefore, I opened up the canopy and manually removed the micro SD card, inserted in my PC and voila it is confirmed that this method works with the MJX C5830 5.8 GHz 720p FPV camera. Since the camera has no USB port that you can plug into on the actual body itself, everything you do has to be done manually. 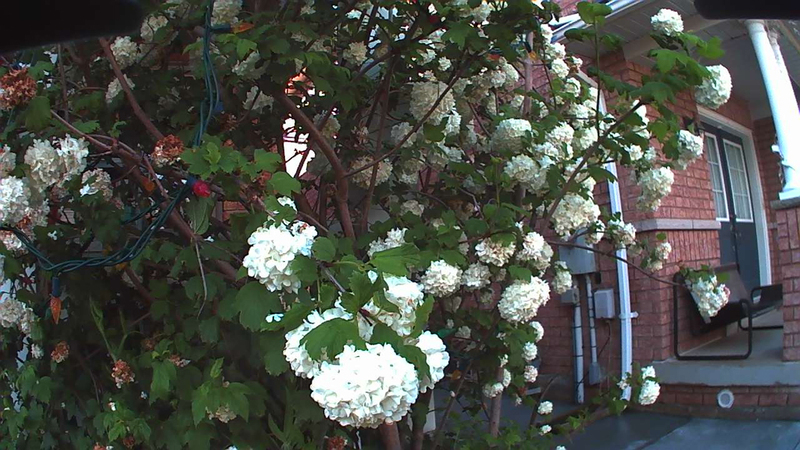 Photos and videos produced by the camera are captured in 720p resolution (1280 x 720 pixels) and are decent overall. I mean you can use them and they appear decent, but don't go expecting anything spectacular. The photo size alone reveal that compression is being used. 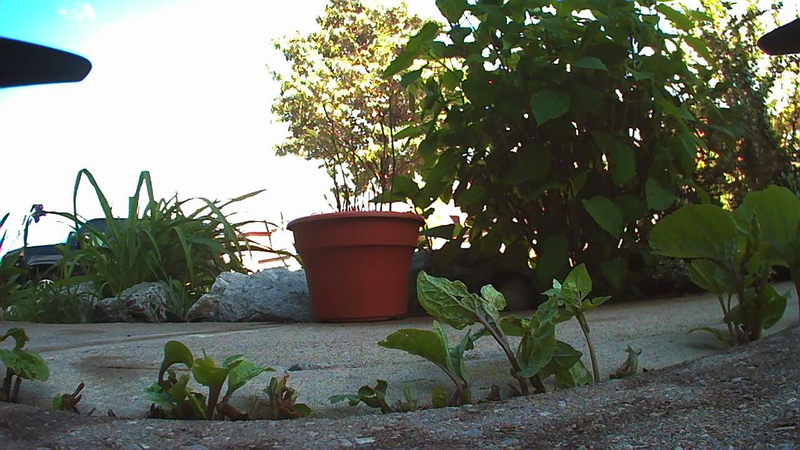 The video bitrate I experienced was variable and ranged upwards to 20.1 Mbps (1280 x 720, 16:9, 30.000 fps JPEG). Audio track is constant at 128 kbps, 8000 Hz, 16 bits, 1 channel, PCM). After further investigation, the EXIF data on the photos reveal that the camera make and model is recognized as the aigo D86, which once Google'd reveals that this is supposed to be a vehicle dash camera. 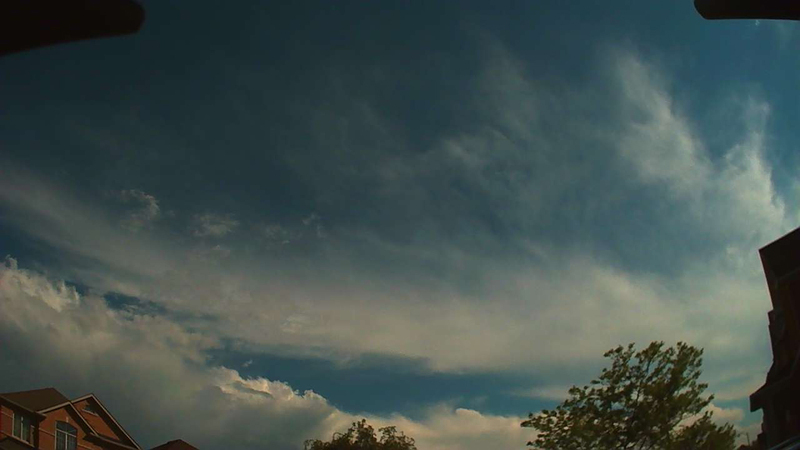 Very interesting stuff I found with the MJX C5830 5.8 GHz 720p FPV camera. So yes you are able to use the C5830 FPV camera to record video and capture still photos like you would do with any other normal camera, however, transferring files out of it will have to be done manually and thus you’d have to remove the canopy of Bugs 8 each time you want to remove the micro SD card in order to transfer files to your computer. MJX does not advertise anywhere that this is possible, so do this at your own risk. I am not responsible for whatever mishaps happen when you remove the canopy of the Bugs 8, but I thought I’d share that such a thing is possible. The only thing wrong with the video recording is the audio track. The audio has a tendency of getting out of sync with the video. Truth is there’s pretty much no point in keeping the audio, since all you hear is the motors screaming and dominating the flight video. You cannot take a still photo if the camera is in the process of recording video. The video must be stopped before you take a still photo. How Does The MJX Bugs 8 Fly? What Are My Thoughts? See My Flights! To make things short, the MJX Bugs 8 250mm brushless FPV racing drone feels to me like it’s the Bugs 3, but on steroids. On high speed mode Bugs 8 feels like a Nissan GTR and is definitely sportier than the already sporty and larger Bugs 3. Both are similar in the way they sound buzzing around, but Bugs 8 sounds a bit more energetic like it has an extra couple hundred more RPMs to spare. I think the physical size being smaller and thus lighter has played a big part in this transformation. It’s also the way MJX has tuned the Bugs 8 to have more yaw rate and angle of pitch which has contributed to the whole zippy experience and agility over the larger Bugs 3. MJX has tuned the Bugs 8 racing drone to have faster yaw (spin) and this is definitely noticeable against the larger Bugs 3, meaning you can achieve faster and tighter funnels. The Bugs 8 has excellent maneuverability and is extremely sporty, especially in high speed mode. Pitch and roll wise, the Bugs 8 250mm racing drone does lean at a greater angle than Bugs 3 and therefore the speed advantage is also with Bugs 8. Low speed mode is quite tame in comparison to high speed mode and frankly I’m a bit confused to why such a low speed mode would exist on a racing drone that is technically supposed to be faster in the first place. I know MJX has targeted Bugs 8 as a beginner FPV racing drone, but still...leave the tame mode to a larger camera bird such as Bugs 3 already is. It would have been better in my eyes to have a single high speed mode so that MJX Bugs 8 FPV racing drone can have one personality. 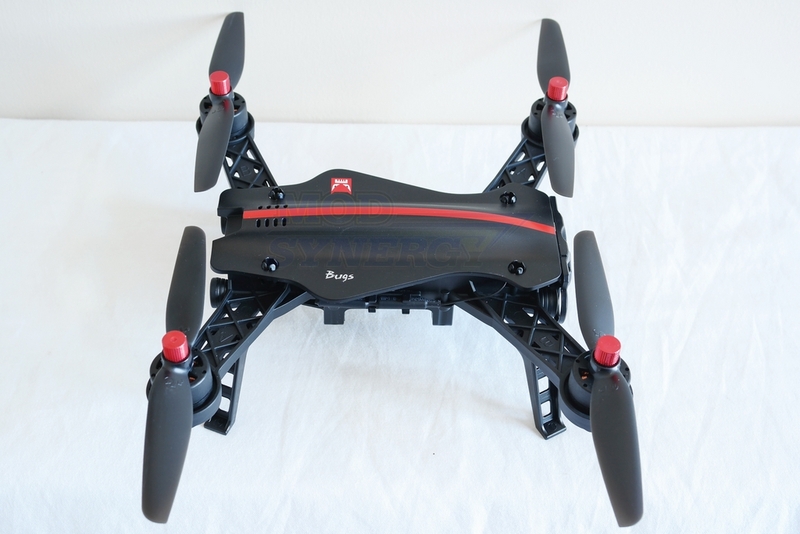 360-degree flips on the Bugs 8 is fantastic and the lighter physical weight compared to the larger Bugs 3, allows the 250mm racing drone to produce much tighter flips and better ascend recovery from the flip. 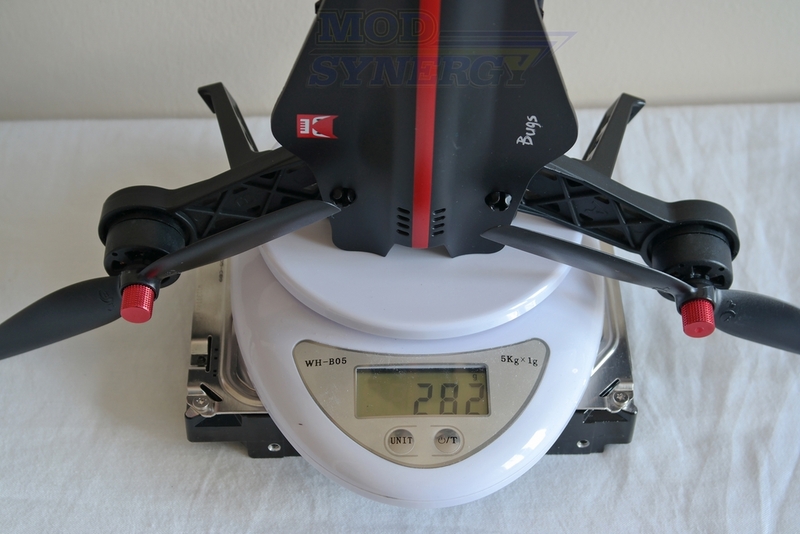 I know that on the MJX website it says that the Bugs 8 FPV racing drone can reach up to 80 km/h, but I think that is overly optimistic. I don’t have a speed gun or a speed trap to confirm how fast it really is, but I really think 80 km/h is not the correct speed. If I had to make a guess just based on eyeballing the drone from flying, I’d venture anywhere around 40-50 km/h seems more likely. Again I don’t have any scientific way in testing this so this is just my opinion. I feel it's always better to be conservative in these ratings and then exceed expectations. Being overly optimistic and then not living up to expectations is not a good position to be in. I think the MJX Bugs 8 250mm brushless FPV racing drone is one heck of a drone and the added aspect of FPV capabilities completely transforms and adds to the overall experience compared to Bugs 3. You’ll be practicing more with the Bugs 8 just for the fact that it FPV capabilities. It’s like a video game that has more replay value. I would say that the MJX Bugs 8 FPV racing drone has more depth than Bugs 3, but I’d still happily have the Bugs 3 to carry an action camera for aerial footage. This MJX Bugs 8 250mm FPV brushless racing drone and larger MJX Bugs 3 brushless drone can coexist on the market and I do not feel they overlap with each other. 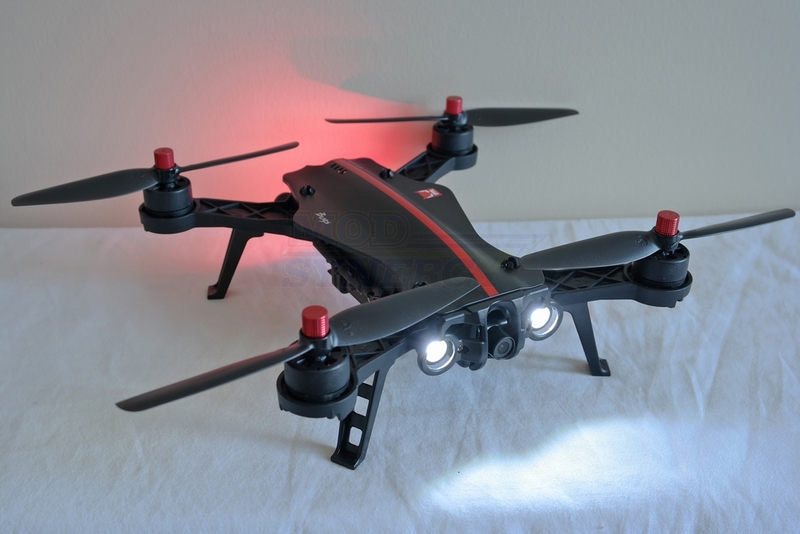 The flying dynamics alone make the MJX Bugs 8 FPV racing drone a keeper in my book. It's powerful, has a sleek profile that slices through wind easier than Bugs 3, and is just fun! 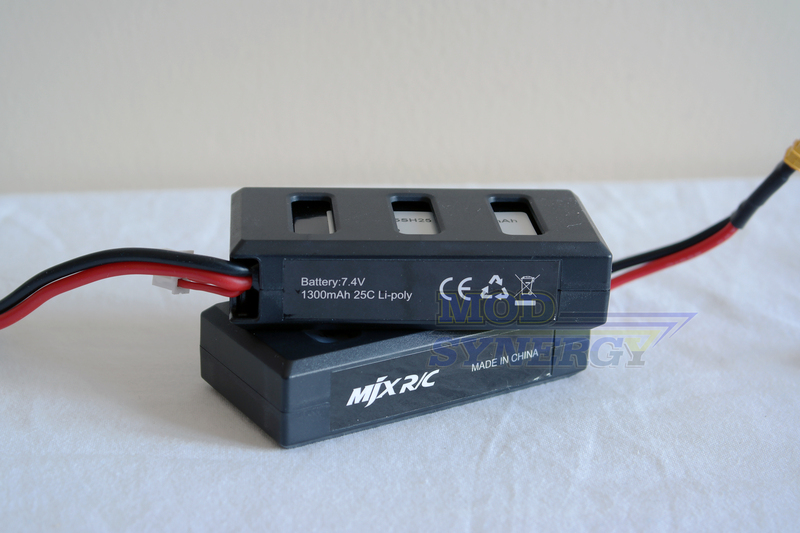 I can only imagine what the MJX Bugs 8 250mm FPV brushless racing drone could have been if MJX decided to have it powered by a 3S 11.1v lithium-polymer battery!! As it stands now, Bugs 8 uses the same 2S 7.4v 25c lithium-polymer battery also offered on Bugs 3, again both share lots of similarities under the hood sort to speak. A 3S 11.1v lithium-polymer battery on this Bugs 8 would have been a clear differentiating factor, but I’m just proposing a 'what if' scenario. Result #1 (Aggressive Flight): Approximately 9 minutes, 30 seconds until low voltage warning kicks in with flashing lights and audible beeping tone on the flight controller, and 10 minutes, 25 seconds until final battery safety cutoff when drone descends with no power left to lift. Approximately 55 seconds for the pilot to land safely. Result #2 (Gentle Flight): Approximately 9 minutes, 56 seconds until low voltage warning kicks in with flashing lights and audible beeping tone on the flight controller, and 10 minutes, 49 seconds until final battery safety cutoff when drone descends with no power left to lift. Approximately 53 seconds for the pilot to land safely. The MJX Bugs 8 250mm FPV Brushless Racing Drone has been designed to give the pilot around 50 seconds to 1 minute to land successfully after entering low voltage warning. The flight controller will constantly beep to inform you once the drone enters low battery warning status. I think this is plenty of time for the pilot to return and land. In terms of claimed battery life, MJX chose to (again) be too bold with their claim of a maximum flight time of 14 minutes, just as they did the same with their larger MJX Bugs 3 with a larger 1800 mAh battery. So it was all too predictable that the new MJX Bugs 8 FPV racing drone would achieve less battery life than the Bugs 3 since they both share the same motor type and similar batteries except for capacity (1800 mAh vs. 1300 mAh). How could one expect more battery life with a smaller battery? It just never added up. MJX is off about 4 minutes with their battery flight runtime claim. With the MJX Bugs 8 250mm Brushless FPV Racing Drone I have been testing, you can expect up to 10 minutes of real flight time, which is actually pretty good on it's own, but feels worse than it actually is when MJX made too bold of a claim from the start. Again, like I pointed out earlier in this extensive review, it's always better to be conservative with numbers and then hopefully look to exceed those expectations. Where Can I Buy One? For How Much? Editor's Note: In other regions of the world, the MJX Bugs 8 is named MJX Bugs 6; both are exactly the same (top canopy style is only difference). Editor's Note #2: The MJX Bugs 8 / Bugs 6 has started to go on sale. For example at GearBest, you can purchase this drone starting from $96 (bare model) to $174 USD (all add-on accessories) minus shipping, which is extra. The MJX Bugs 8 250mm Brushless FPV Racing Drone is not on store shelves yet, therefore, I don't have any concrete pricing to share. From what information I have been shared, I would give my guess that the complete MJX Bugs 8 FPV racing drone with everything you see in this review (MJX Bugs 8 + C5830 5.8 GHz 720p FPV camera + G3 FPV VR Goggles + D43 5.8 GHz 4.3-inch LCD Monitor) would end up costing at least $250 CAD. This is just a guess. The MJX Bugs 8 will eventually be sold worldwide through popular Chinese online retailers such as Banggood, GearBest, GeekBuying, Lighttake, DX, and more. I am NOT affiliated with any of these websites mentioned, so I have no clue if they are good or not. If you prefer to shop on Amazon like I do, then it'll probably take a longer while before the MJX Bugs 8 FPV racing drone ends up on Amazon at a higher cost. I'll update this review when I know details more about pricing. Why do I like Amazon? They are fast, honest, reliable, and their return policy is great. I actually got money refunded back to my account after Amazon overcharged me on duty costs; talk about being an honest company, most others would keep the money and not say anything! If you're thinking of purchasing the MJX Bugs 8 250mm Brushless FPV Racing Drone, or anything else for that matter, please use our Amazon links below, it will help us out greatly, and go towards supporting this website and any future contests we hold through Facebook. The MJX Bugs 8 250mm Brushless FPV Racing Drone is a fantastic drone that has a lot of depth and excitement. 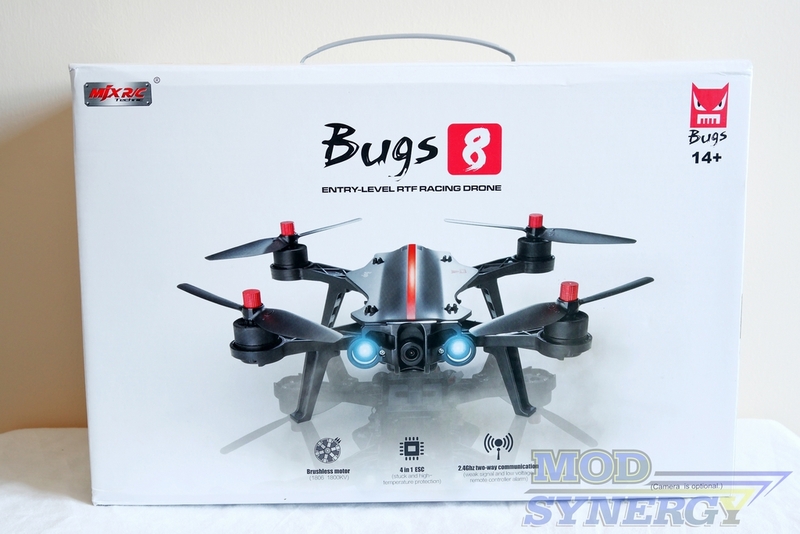 First and foremost, Bugs 8 is peppy and agile with excellent maneuverability and definitely has that athletic feel you would expect in a racing inspired drone. I love the styling of the Bugs 8 and think of it as the sleekest and sexiest drone I’ve seen on the market. 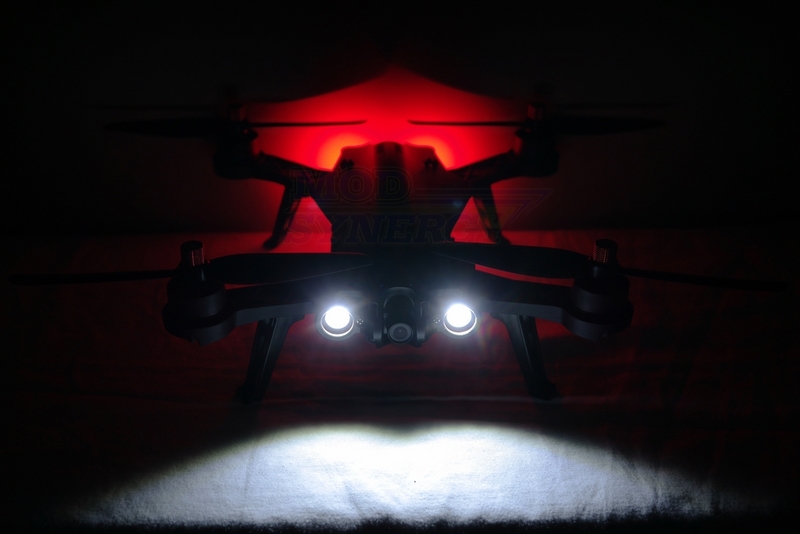 The light show on Bugs 8 is something to behold and makes night flights possible with bright white LED headlights and bright red LED taillights logically chosen to make orientation fool proof. The lights add to the visual flair of Bugs 8 and gives off that futuristic race inspired aura. The Bugs 8 is the best looking drone I’ve reviewed, hands down. 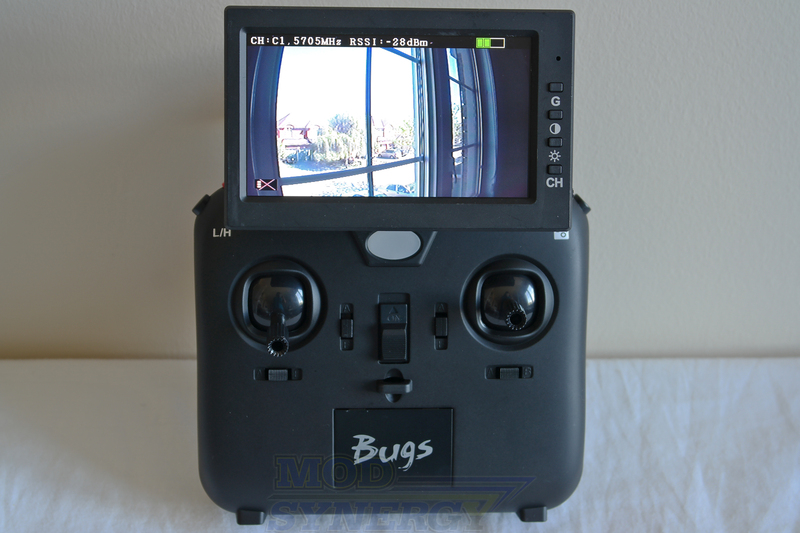 The FPV capabilities of the MJX Bugs 8 250mm brushless FPV racing drone set it apart from other drones on the market by offering a satisfying experience with very little setup required to get the C5830 5.8GHz FPV camera up and running with the MJX D43 5.8 GHz 4.3-inch LCD monitor. Live FPV video feed transmission is virtually lag-free when up and running meaning you can feel confident that what you are seeing on the screen is what exactly is happening real-time in the air. The image is clean and the reception is pretty good minimizing times where the screen will come across with interference (artifacts) on the screen the farther away you fly. I do have to say that I did feel and experience the entry-level moniker to the MJX D43 5.8 GHz 4.3-inch LCD monitor, because it uses a TN panel which limits and restricts viewing angles. There were times I wished I had a better screen just the viewing angles were annoying me. The ball joint mounting system on the flight controller is sufficient, but I did feel it should have been secure because depending on how you position it, your thumbs while flying might accidentally hit the monitor and moving it out of position. This slight negative is manageable for the most part, so it’s not a deal breaker. It will take some getting used to if you’ve never tried before, but I thought the MJX G3 FPV VR Goggles added another layer of depth, excitement, and experience to the Bugs 8 250mm FPV racing drone that will keep you busy as you try to figure out and master flying in FPV. Certainly I can say I’m not exactly comfortable with FPV flying yet, especially with large Goggles on, but I did appreciate how comfortable it felt with the MJX G3 FPV VR Goggles on my head. The weight did initially cause the goggles to droop down, but I found that the adjustable Velcro straps were good in relieving that issue. Hope you don’t get dizzy! 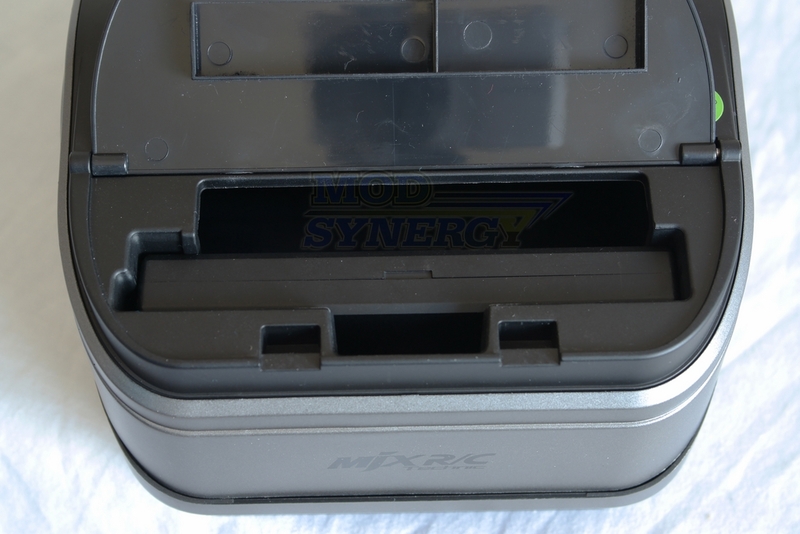 I absolutely love the fact that MJX bundles two batteries in the box for Bugs 8. This means the pilot will have more flight time and less down time. A spare battery is a must. The MJX Bugs 8 250mm FPV Racing Drone does more things positive than negative, which isn’t much to begin with, and for this reason I feel MJX has another winner on their hands with their Bugs 8 brushless drone. Keep the good drones coming MJX! It is only fitting that I end this review by awarding the MJX Bugs 8 250mm FPV Racing Drone our highest honor, Editor's Choice Award rating!